Past events, which show how we remain steadfast students on our Aiki path . We are sharing, learning and advancing our understanding every time. Lewis Sensei demonstrates while Mark Allcock of Wellsprings Aikido (seminar host) looks on. Above photos from Sensei Lewis seminar at Charlton Down. 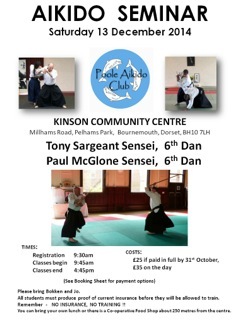 Organised by Wellsprings Aikido poole. 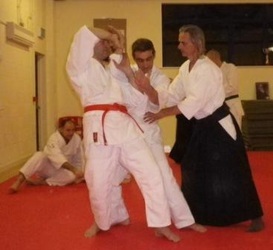 The two Jo images are of a student, Mark, demonstrating kata. 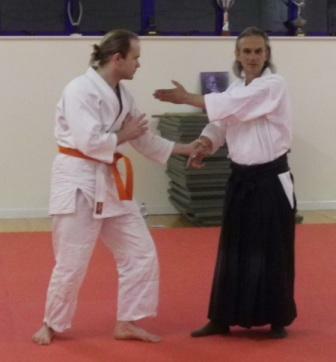 ​Sensei Mark Allcock of wellsprings Aikido Club in Poole kindly let me teach his December 3rd Sunday evening class. With bright, open minded and willing students the two hour class was an absolute pleasure to take. Aikido can be truly joyful. Brilliant workshop at Kinson with Senseis Tony Sargeant and Paul McGlone. I really felt that the message was on track for O-Sensei's Aikido. Really valuable lessons for me. Richard Small. It was a pleasure to welcome David Worsley 6th dan of Plymouth school of Aikido, also Tre Worsley 6th dan, and Alec and Ian. Most welcome. Mike from Taunton also made the effort both in long journey and in the training. A good day was had by all as we pursued personal development in this magical art we love. ​ which we examined in the first hour. Positioning and strength of grip on Jo. Always add a spiral for added power, even if unnoticed by observers. Use body not arms. Remain centred, extending Ki in different directions (your body will willingly join in with your mind intent) Remain relaxed but connected throughout body as well as in movement. Internal power can be enhanced by cross body connection. Extend spirit beyond end of Jo. Avoid feeling your own power regardless of how great it might feel - when you can feel it, it can be used against you.You don't even have to grip the Jo to move your opponent. When feet, hips, shoulders and hands are in harmony with the alignment of the Jo and you remain centred you maximise your soft power. (Upside down U idea.) Use of hips may be easier understood by thinking 'hip crease'. If at anytime you feel the need to prepare - then you were never ready ! For those who explored these ideas and others at the workshop these pointers may help to jog your memory. Friendly, purposeful, valuable, happy. 28th 29th October 2016. ​Look out for next year's well organised seminar ! 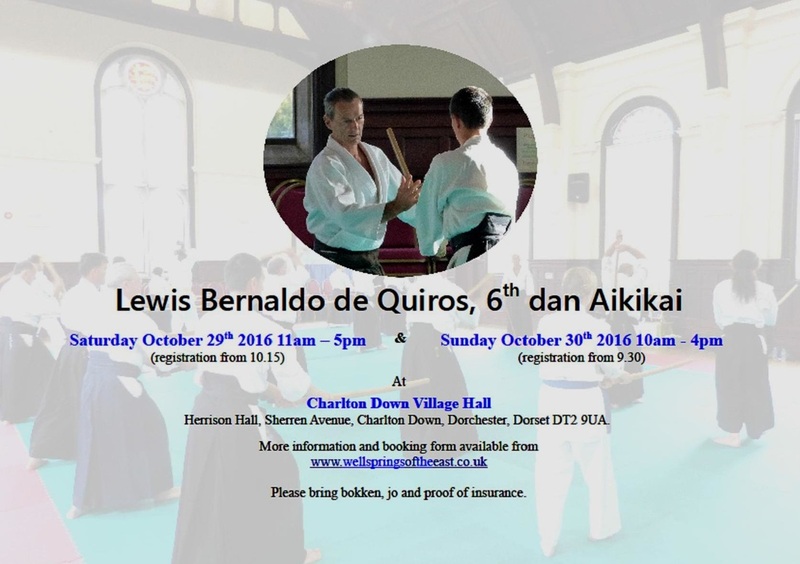 2016 Burwell Festival of Aikido - a truly international event. Switzerland, New Zealand and Jersey. 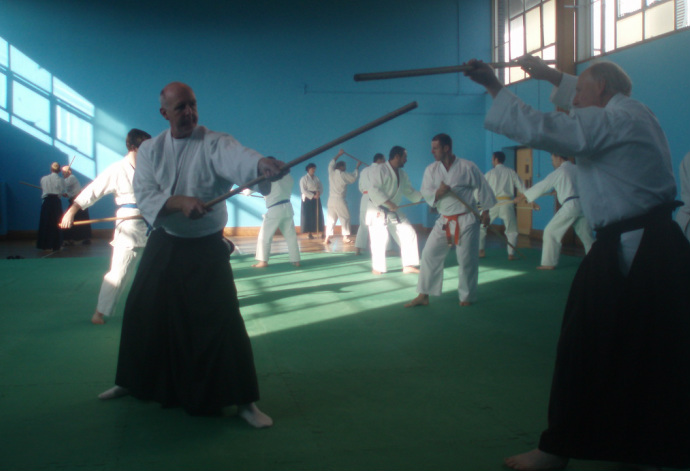 Special Aikido weapons class for Aiki Peace week. 18.30 to 21.00 hrs at Methodist Church Hall (lower room) Bideford, North Devon. The class may include Jo and Ken, both may be borrowed for the evening from the club. Main instructor Richard Small 4th Dan TIA Europe. 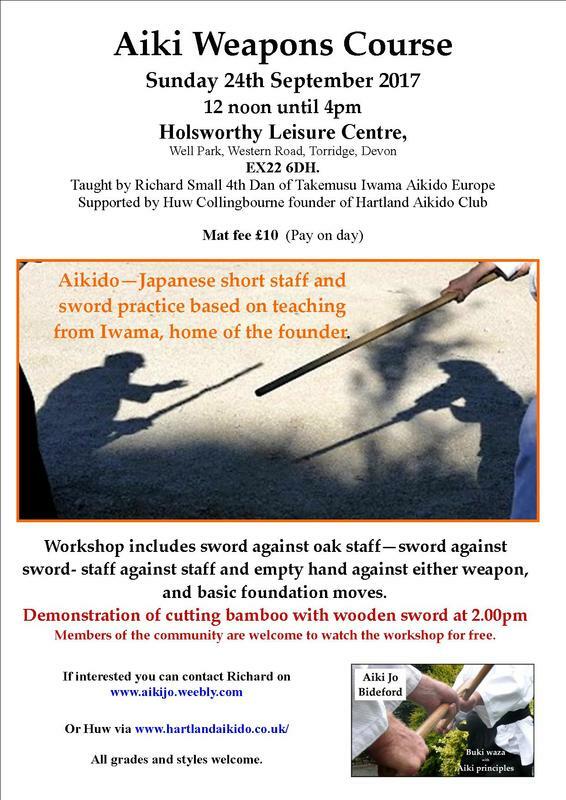 Hopefully Huw Collingbourne, an excellent teacher and skilled practitioner of Ki aikido will also teach. Fee, donation only, for charity. Insurance may be available if needed. ​Everyone is welcome regardless of style, art or level. 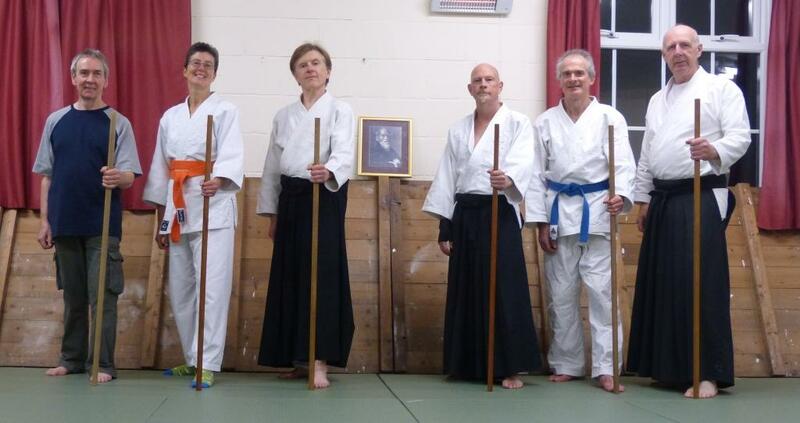 An evening of weapons training with Masakatsu Aikido Club, Devon U.K.
hosted by Dan Hopkins. Thursday April 21st 2016. Covering the one thing you will always need - basics and foundations ! Challenge your current understanding join us. Invest in yourself and keep the change. 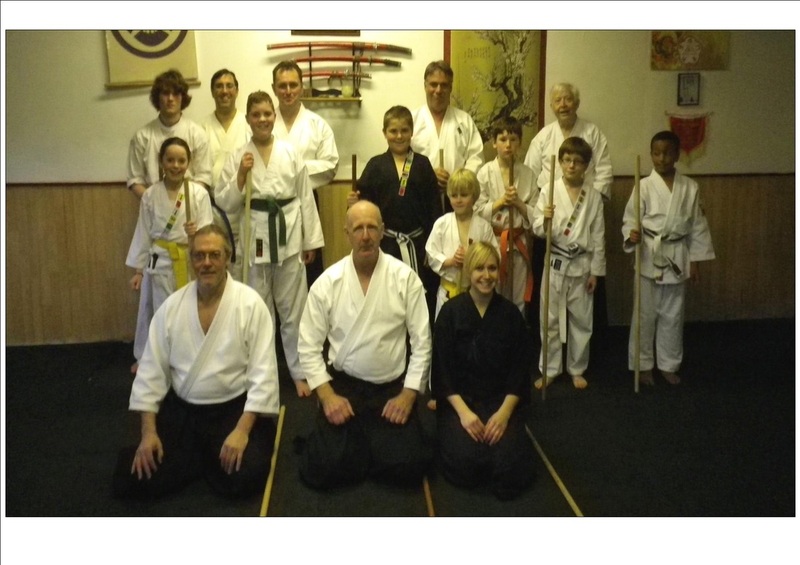 Photo left shows the Saturday students of the two day Weapons course hosted by Sensei Vince Lawrence. 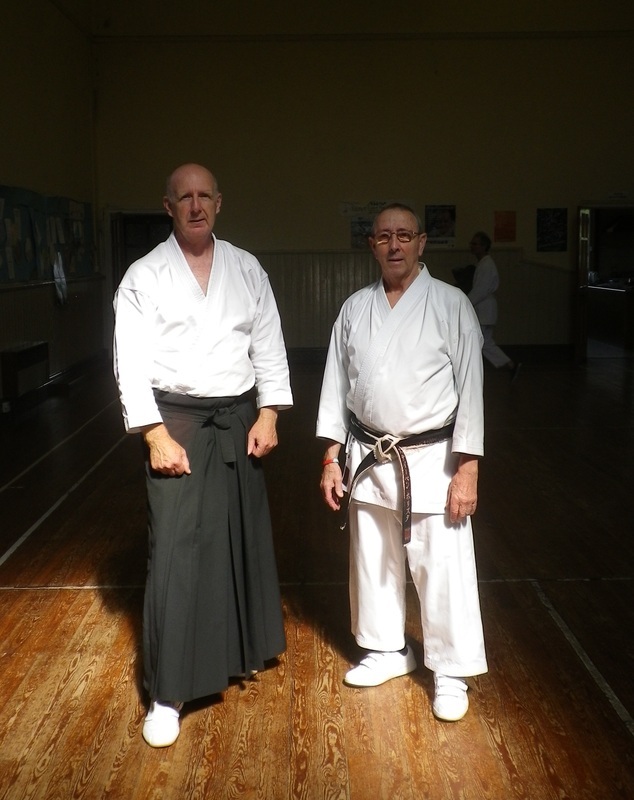 Visiting teachers Sensei Frank Burlingham 6th Dan and Sensei Vince Hammond 5th Dan. A brilliant, friendly and informative weekend of mainly weapons and their association with tai justsu. 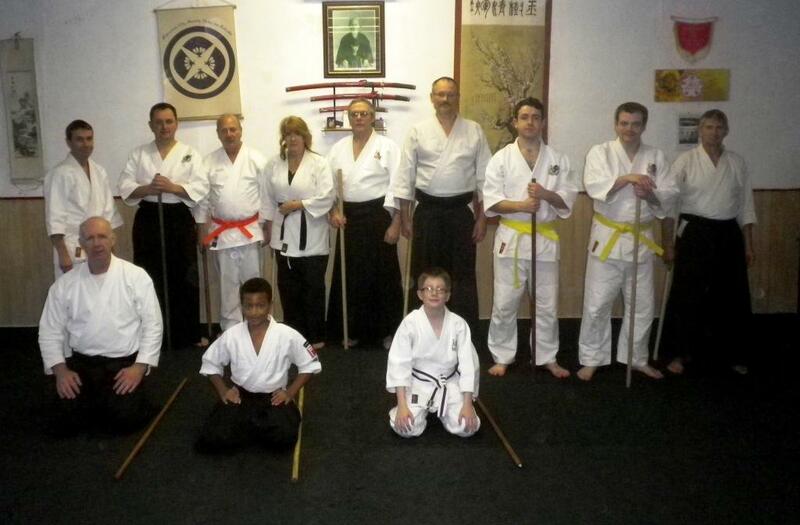 Poole Martial Arts and Fitness Centre. Friday evening 19th March 2016. I had the great fortune to be invited to teach at Mark's class. Numbers were low due to it being half term but we made some great progress in what I consider highly important principles. Not feeling your own power coming back to you . . . which means nage isn't sending messages of intent to the point of contact. Keeping joints open, being centred but exploring this as an open expanding centre. Moving consciousness through and beyond body in order to access greater power. Gripping - though holding their arm your mind is gripping their centre. If you use the body properly no apparent force is required in the arms, Eg, a powerful Jo parry can be made with only thumb and first finger on the Jo as long as the connected body power is used. There was much more too. Thoroughly enjoyed my time with the students of Wellsprings Aikido club. Thank you. Richard. 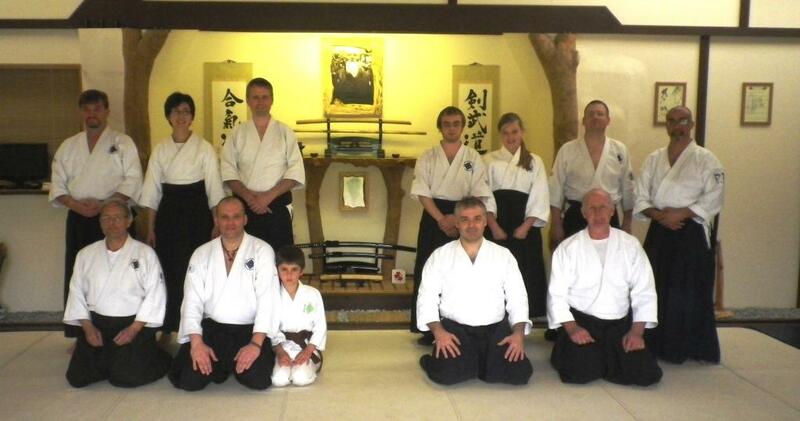 ​PS a lovely Dojo to visit and to train with interested and friendly students. 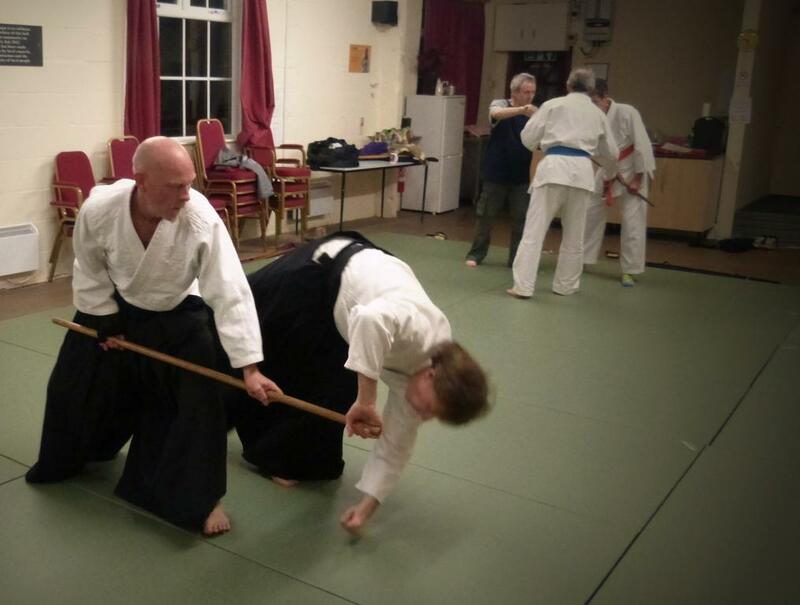 Tuesday 5th January 2016 sword and staff weapons class at Bucks Cross for Hartland Aikido Club. All welcome. Not been there before? Well join us this time. ​Make a good start to your new year. Due to a bout of Flu, Richard is sadly unable to attend. Perhaps another day. Looking at the principles left in our minds by Lewis Sensei. Jo Kata and Tachi dori on the list. 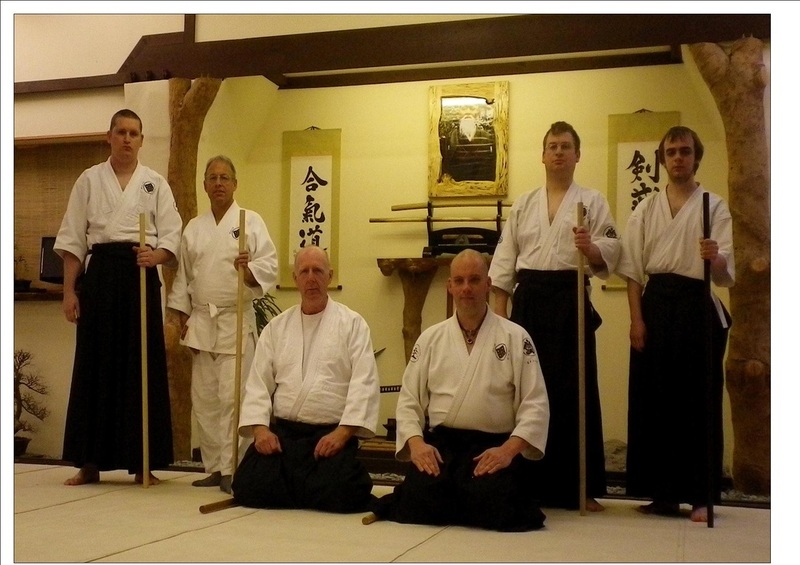 Thursday evening November 19th 2015 Masakatsu Aikido Club hosting aiki weapons workshop. At Escott near Ottery St Mary, East Devon. Contact Dan Hopkins Sensei if you wish to take the opportunity. We looked at some principles with Jo 6 kata as an example, extension of energy, centred and awareness. Jo parrying using body not arms (use of hips or foot turn to drive a spiral of power into parry. 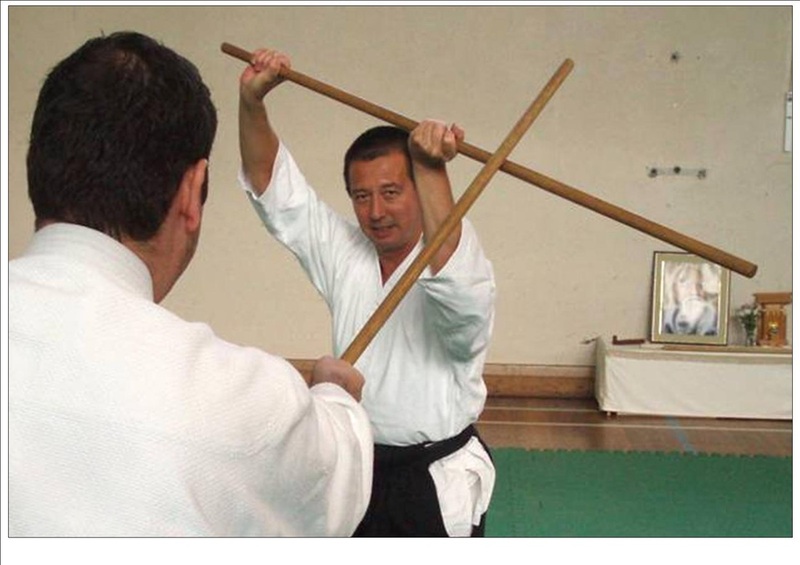 Also 3rd Kumitachi with variations and the connection with tachi dori. Herrison Hall, Sherren Avenue, Charlton Down, Dorchester, Dorset DT2 9UA. An evening exploring development of self through Aikido, particularly the benefit of weapons training. see club link below for more details if you are interested in joining us. "Our aim is to run the club within a friendly environment without the machoism generally associated with martial arts clubs. Aikido is suitable for women & men, young or old (14 years minimum). 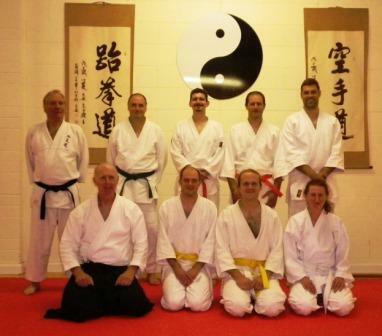 Graham Cossey (2nd dan) Chief Instructor "
open invitation to all styles and levels. Raising money for Aiki Extensions and under the auspices of Aiki Peace week. 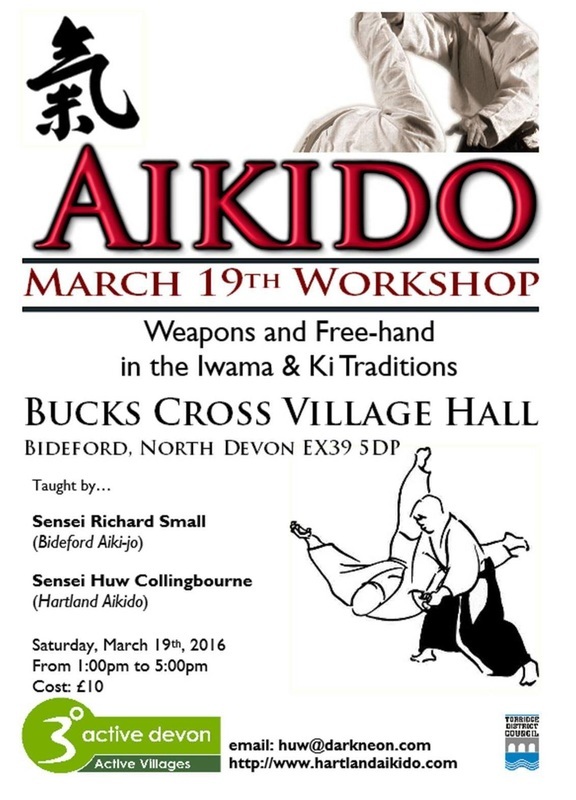 Supported by Aikido enthusiasts from Dorset, Somerset and all over Devon. Many thanks to all who came. Looking at 6 kata and partner work, 3rd kumitachi and variations. Thursday 7 - 9 pm 16th July 2015. Visiting students came from the furthest parts of Devon and from Somerset to take part in this weapons oriented workshop to raise money for Macmillan. We raised the grand sum of £103.50 for the charity and at the same time made good friends and furthered our studies. Sincere thanks to all who attended. Thanks must go to Sensei Huw Colingbourne for this initiative and generosity of spirit. Note to self . . . ignore sat nav in future ! 3rd May 2015 combined styles seminar in Chudleigh Devon. Initiated by Huw Collingbourne Sensei 2nd Dan of Hartland Aikido. A cross-cultural seminar with instruction by Geoff Flather sensei of Banyu Hatten Aikido Yuishinkai and by Richard Small sensei / Huw Collingbourne sensei of Hartland Aikido. A mixture of weapons work and empty hand taught by three experienced sensei from a wide variety of backgrounds. Two sessions separated by a break with tea, coffee, etc. And maybe (probably. Alright, definitely) homemade cakes. Please bring bokken and jo, and proof of insurance for non-BHAY/HA members. all the teachers who have gone before us as a result of whose efforts we can train aikido today. 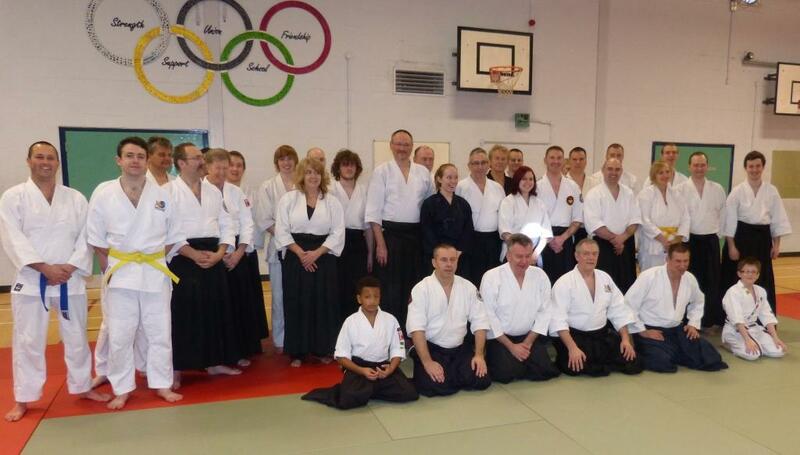 Our grateful thanks to the Sensei who have all kindly donated their time for this event. 100% of profits Donations can go to a charity working in our local community. If you are intending to come to train at the Festival please let us know by emailing enquiries@wellspringsoftheeast.co.uk so that we have some idea of the numbers attending. Remember to bring your bokken, jo and proof of insurance! if last year's event is anything to go by. If you want to learn something and be happy too, then watch out for next year's event.
" the lesson plan as yet untaught." 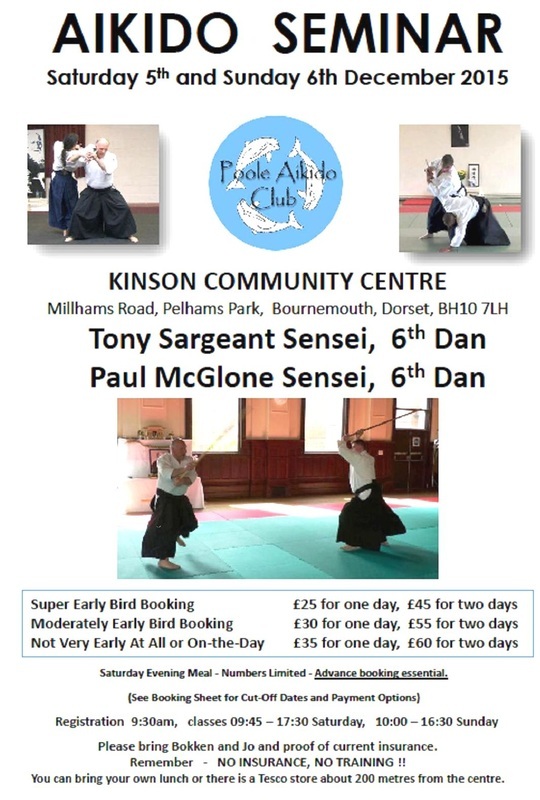 Hosted by Wellsprings Aikido Club Dorset. Gosford Lane, Ottery St Mary, Devon, UK . 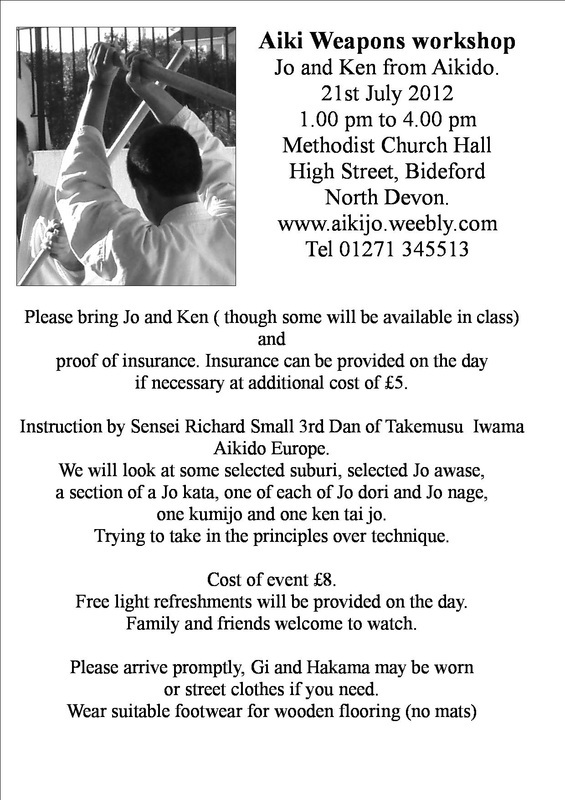 Tuesday 3rd February 2015 Iwama style Aikido weapons class, based on the 13 Jo Kata and the associated partner work, in North Devon hosted by Hartland Aikido Club, located in Bucks Mills. 7.30 - 9.30 pm. All styles welcome. This was one of the most interesting of seminars. The teaching was superb and full of attention to the principles of Aiki. 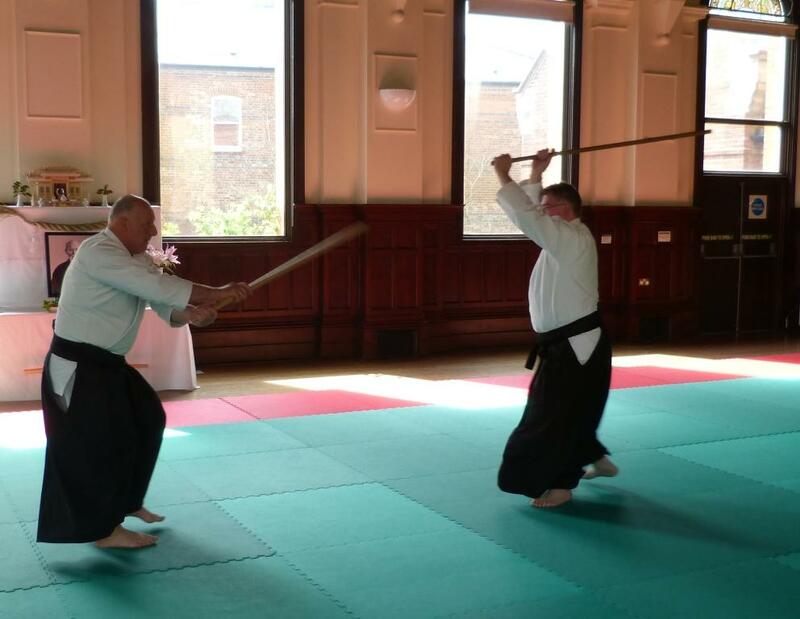 Sensei McGlone taught a fascinating and informative weapons class and Sensei Tony Sargeant helped all students to understand the development of aiki principles and takemusu. Brilliant all round seminar. 'Examining principles in all we do' and lots of other stuff too. Sadly the above event was cancelled due to a tiny fire in the building. Looking at Jo Dori and Jo handling principles. Try out a couple of throws. BAB National Course in Cardiff, Wales, on 4th October 2014 . Sensei Sargeant explaining the vigilance required to avoid the weaknesses we so often allow in our Aikido. left to right. Richard, Mike, Huw, Bob, Dan, Pete, Dermot, Alan, Mark, Michelle, Wendy. An international initiative to bring principles of peace into the community. Raising money for Macmillan Cancer Care. 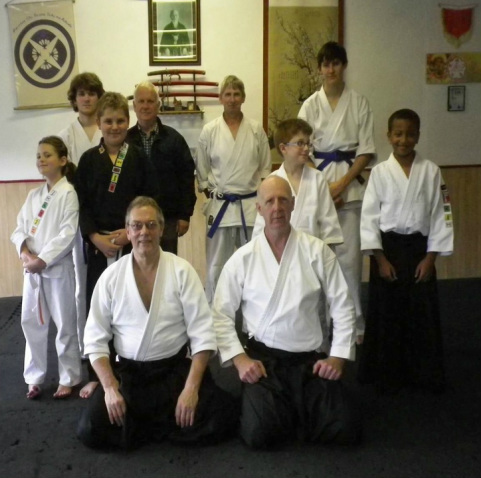 Students and teachers from different Aikido styles, stand together in harmony. What is harmony if it isn’t peace? O-Sensei, the founder of aikido, said that 'Aiki is not a technique to fight with or defeat the enemy. It is the way to reconcile the world and make human beings one family'; A martial art with interesting ethics and methodology. Aikido is a long journey . . . in many ways. 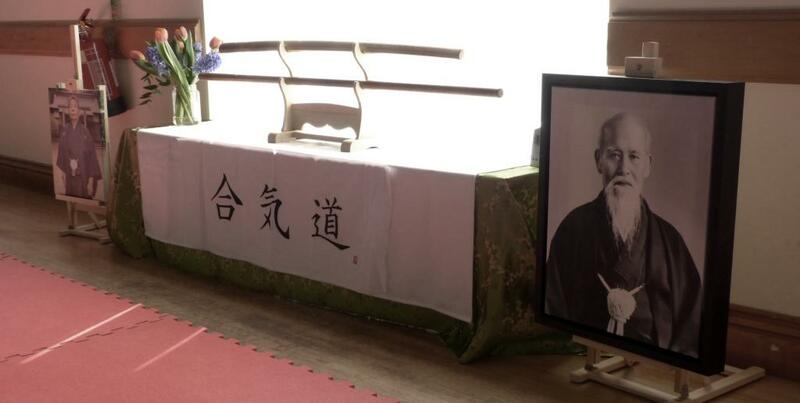 Sensei Bob Sherrington travelled all the way to Devon from Kettering Aikikai in Northants to share the day and his skills; An act that epitomises the generosity, humility and ability of a great teacher, an act that we can only admire. His teaching involved short staff against the sword and to say the least was mind catching. Those who practise will know what I mean. Sensei Mark Allcock of Wellsprings Aikido in Poole, Dorset also travelled to teach. Again a humble and popular teacher, Mark showed the development from basic exercises to advanced weapons techniques and how in part they remain essentially the same in application. 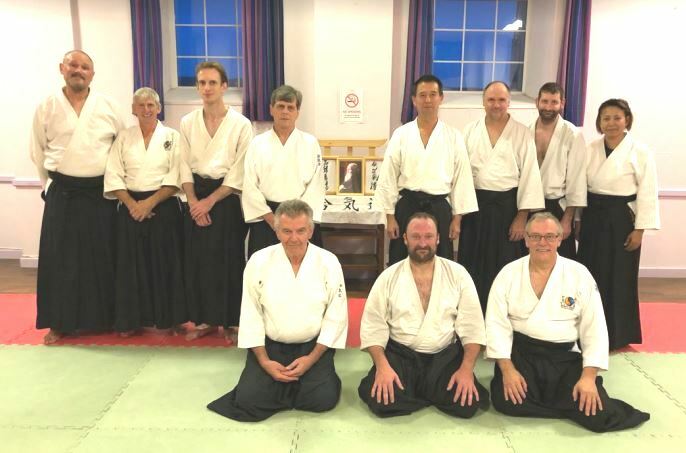 Some of the students that also travelled far were Dan Hopkins representing Masakatsu Aikido from Ottery St Mary and Mike Williams joined us from Somerset. In marked contrast and despite extensive advertising including local newspapers, there were few local students or observers that chose as a community of one mind to take this wonderful opportunity to come together in such harmony. . . in peace; on the day before United Nations Peace Day. 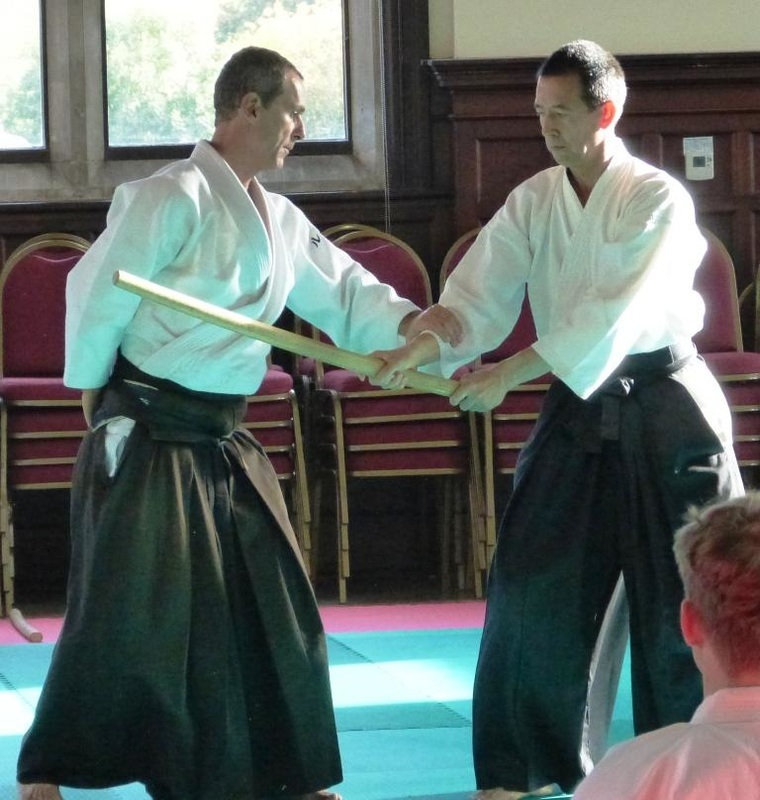 Richard Small (organising) taught sword against sword partner practice using the third kumitachi and emphasising the connection and harmony within self and with others. Sensei Pete Blayney demonstrated some elegant flowing Aikido and wonderful skills in the use of Ki (energy) leaving most of us struggling to copy his excellent example. For Observers it was only £1 donation to the charity Macmillan Cancer Care. There were more refreshments than could be eaten and three hours of enlightening martial arts entertainment, it is such a shame that more people did not come and enjoy the day. However, those of us who did attend had a great day in good company and we raised £161.60 for Macmillan Cancer Care. All clubs and styles welcome. Observers and visitors also welcome. Join us on the day and see what it is all about. All clubs and styles are welcome. There will be no mats down so students should be advised to wear comfortable footwear. One more teacher joining us. 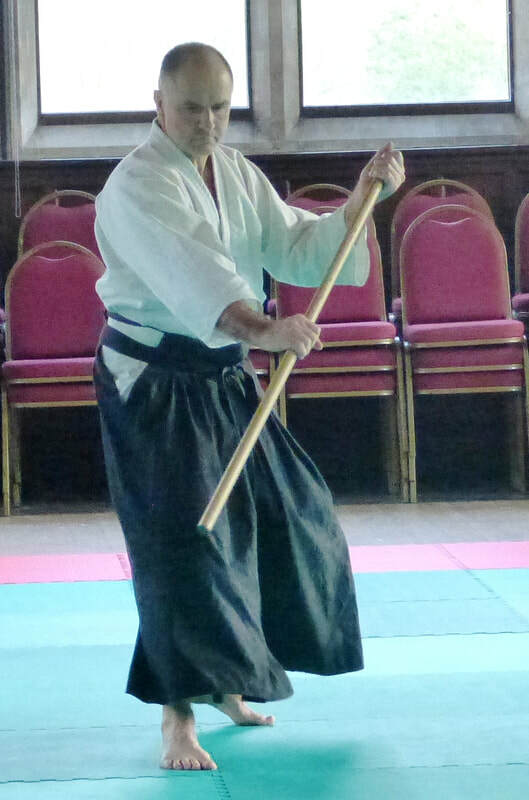 Sensei Bob Sherrington (4th Dan, Traditional Aikido). who practiced under Ron James (from the 'Hut'). and Tom Moss (Yama Arishi, Coventry). Please support this good cause in any way that you can. Tell others about it please. 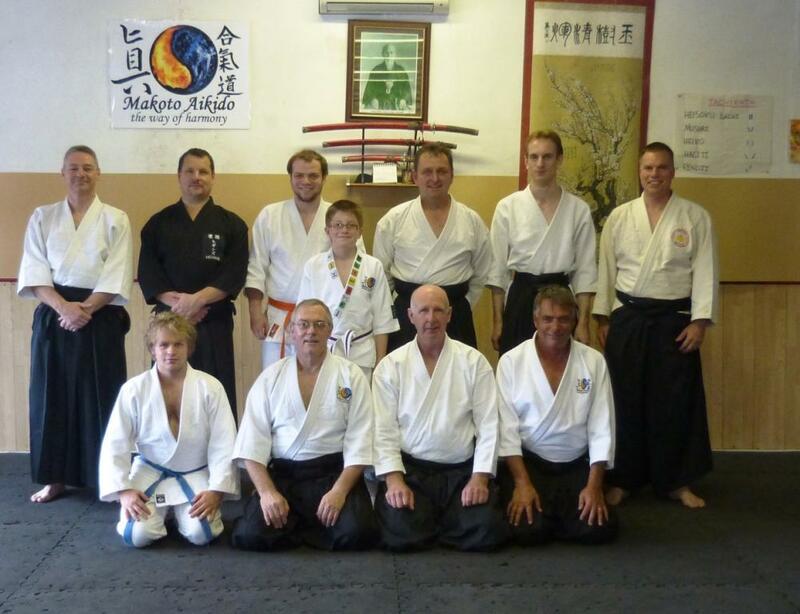 Saturday 13th September 2014 at United Dojos in Taunton. We looked at the principles of centering, of blending, energy and optimising Jo grip, use and timing. We used sections of 13 Jo kata partner practice to explore these principles. ﻿We briefly explored O-Sensei's Jo Misogi and how it can affect the sensitivity of the receiver of an attack. We also explored ways to 'effortless power' through opposites, whether they be physical or through use of mind intent..
August 9th 2014 at Ringwood. 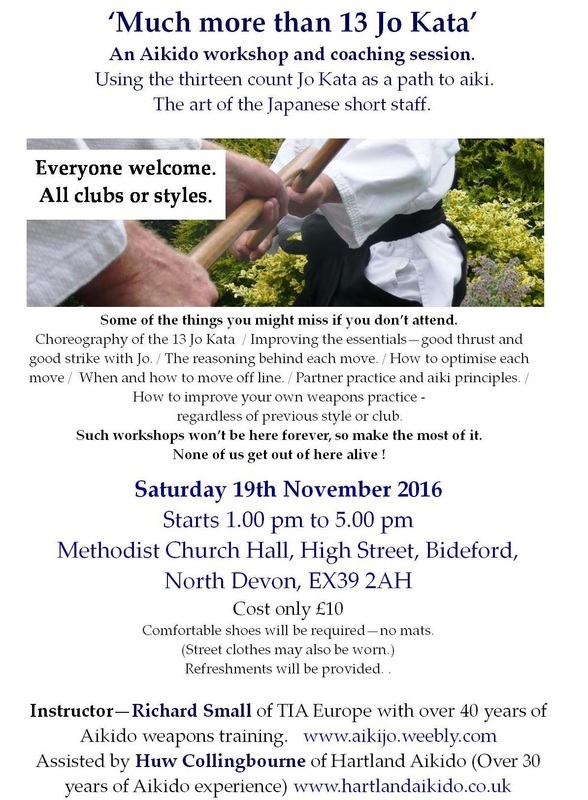 hosted by New Forest Aikido Club. Pushing for peace, seminar at Burwell, Cambs. Quentin Cooke 7th Dan centre. An amazing array of skilled and dedicated teachers from around the world gathered to share the dream of peace . . . and see if they could make it real. Tai Sai with Sensei Tony Sargeant, hosted by Sensei Mark Allcock of Wellsprings Aikido. More photos to come later. 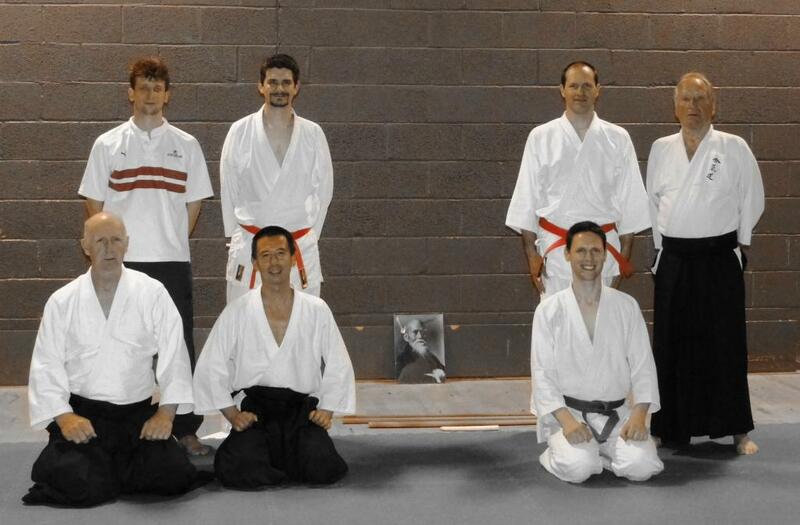 26th and 27th April 2014.
gone before us and, as a result of whose efforts, we can train Aikido today. Charlton Down Village Hall. Near Dorchester. Dorset DT2 9UA. Open to all aikidoka. Please bring your bokken, jo and proof of insurance. Senseis Tony Sargeant and Paul McGlone demonstrate key points in the 31 Kata partner practice. 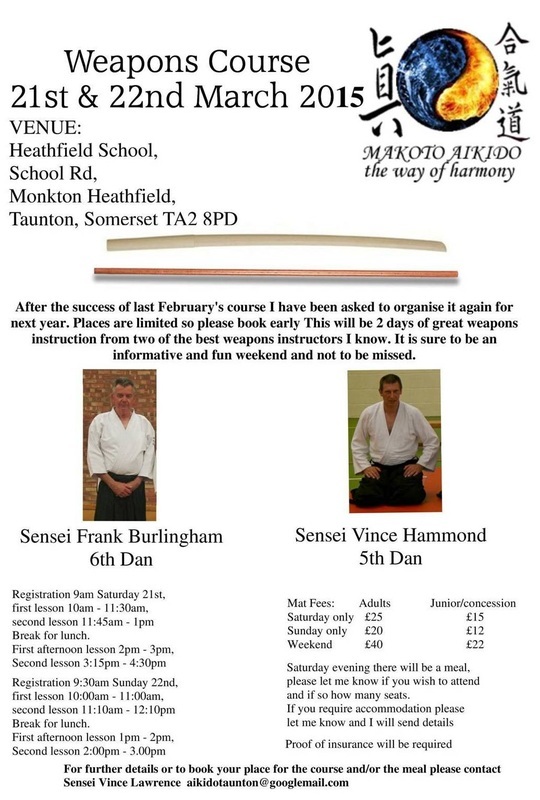 Weapons workshop weekend hosted by Vince Lawrence 4th Dan Taunton. 15th and 16th February 2014. A friendly, informative and most pleasing event to attend. 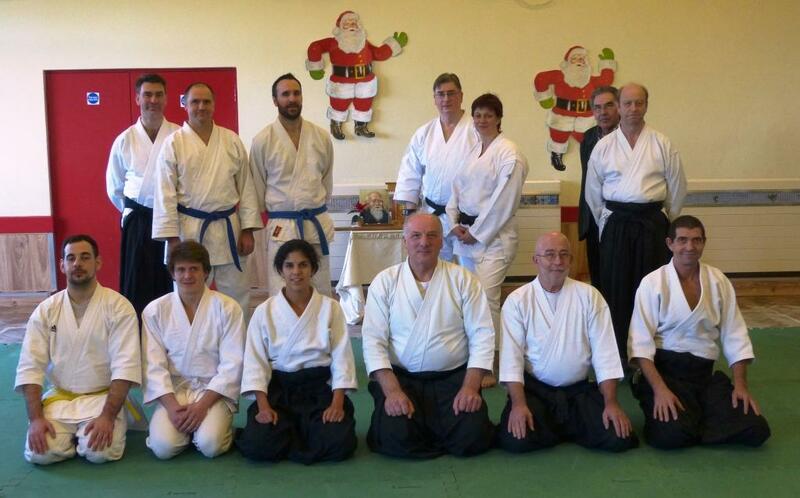 December 2013 and the last of a series of Bukiwaza hosted by Wellsprings Aikido Club and taught by Sensei Paul McGlone 6th Dan TIA Europe. The subject was 1-5 Kumijo. Regardless of level anyone would have found something of value to take away. 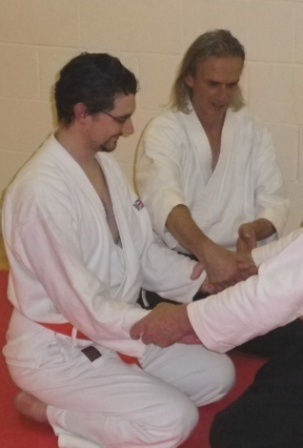 a teacher highly respected for his technical expertise in the Aiki weapons as taught by Saito Sensei. Details on Wellsprings Aikido. 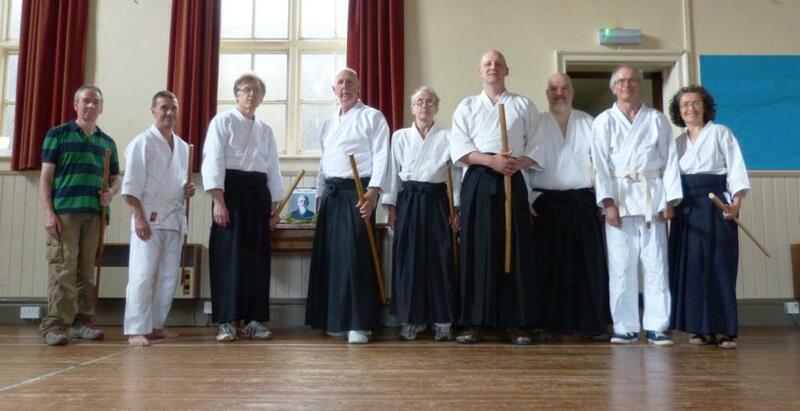 United Dojos in Taunton will be hostiing Aiki Weapons a workshop on 12th October 2013. Visiting teacher Richard Small 4th Dan TIA Europe. Suitable for all styles and levels we will look at technique, blending and sensitivity in tachi dori. 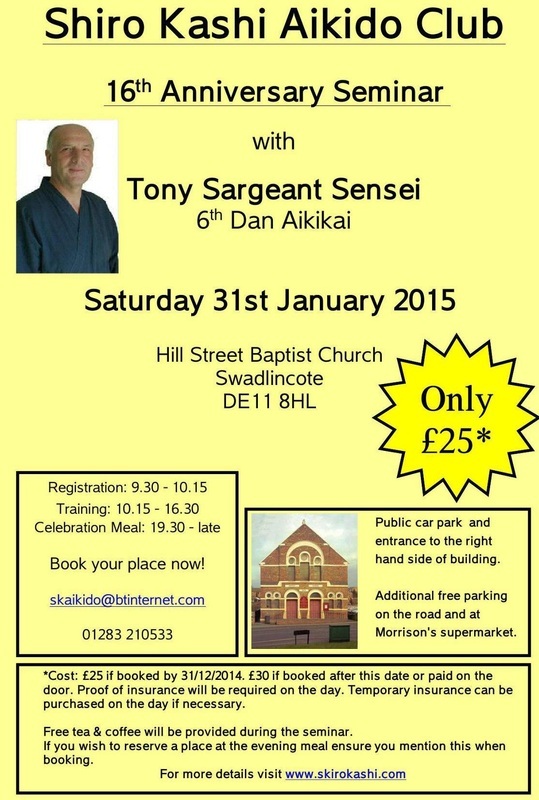 Seminar marking 40 years of Aikido practice by Tony Sargeant Sensei.
. A brilliant seminar filled with 'secrets'. 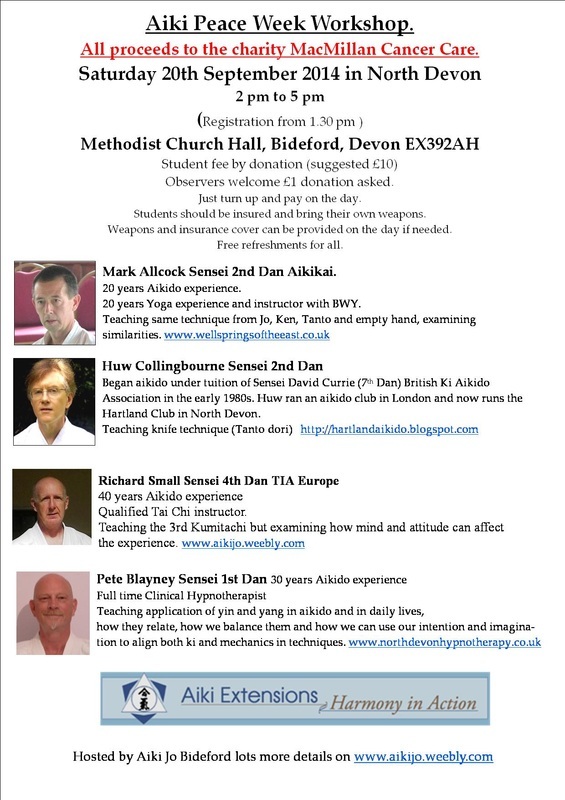 in North Devon, to celebrate the closing of International Aiki Peace week. “Aikido is not a technique to fight with or defeat the enemy. 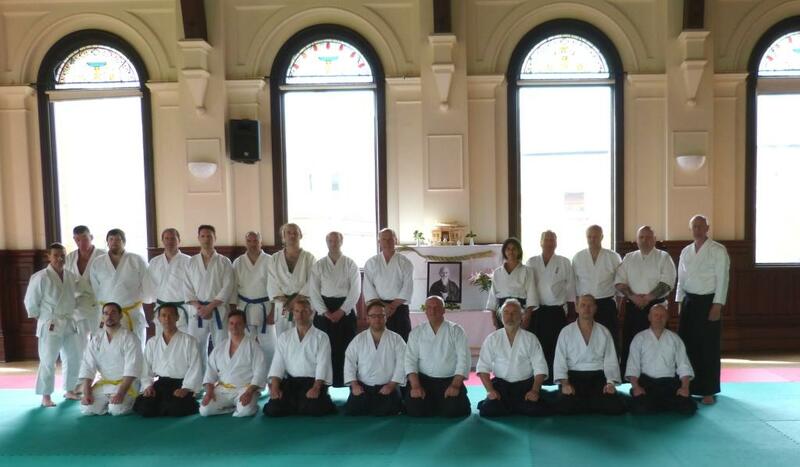 Resume; UN Peace day 21st September 2013 Aiki peace event Barnstaple, Devon. 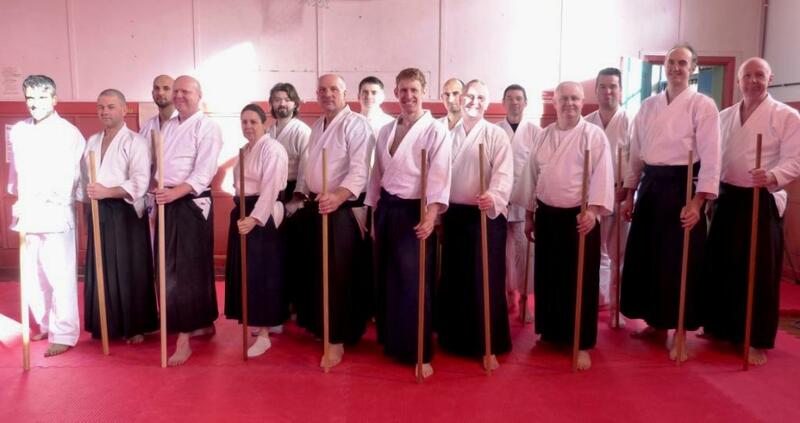 In a world that continues to tear itself apart in conflict and in an Aikido world that is so often divided by politics and egos, six teachers of varying styles made a difference and took part in something special. We did good things in the name of peace and charity and we did it together with one spirit . . . the spirit which we each might feel was the wish of O-Sensei for us all to know. One of the tenets of peace is equality and on this day we bowed to O-Sensei as equals, student and teacher alike regardless of grade; there was no shuffling to find your graded place, your place was wherever you knelt. Another facet of peace is respect; respect for others and their ways and opinions. Respect we all enjoyed as we informally studied our art yet with seriousness of purpose. Despite outwardly obvious differences in styles it was as equally obvious that the core principles are ever the same. If you are tempted to look down on another style then I’d say go and practise with them, we soon discover we have our own weaknesses to overcome. At the end of the seminar we all lined up together, one line united. This is a great joy; truly an example to others of the way of harmony. All proceeds went to Macmillan Cancer Support (£145). The use of Tenchi Ryu dojo was a gift from Sensei Brian Stockwell. Huw asked us to do nearly the impossible. . . forget all technique, and how difficult it is to do so after putting it into your body over so many years. Huw wanted us to explore ways of exploiting Uke’s balance to advantage. Simple as that … just not so simple to do in practise. . . Huw showed how simple and effortless it is to escape from ushiro ryote dori. I couldn’t stop him and couldn’t do what he did either. Jenny demonstrated clearly how to overcome a much larger and stronger attacker; showed the advantages of hands in front of centre, explained with great clarity the way to use hip power connected through the body to move an attacker. . . example was iriminage. Once again the emphasis was on body movement with arms moving as a result and not independently. It solved a long term puzzle over iriminage for me. Mark started his session with aiki taiso and the idea that first we should make peace with our own body, removing conflicts and tensions within. He then brought the Jo back into training and we practiced three of the tsuki awase. Emphasis was again on ma ai, positioning of Jo, use of hips and not arms and on joining and blending not conflicting with the attack. Andrew told us two stories, two important stories, one about himself and his journey and another ancient Zen story about true power residing in a state of peace. An extremely competent display of focussed and balanced power emphasising, not only body direction but eyes too. Once again the point about the term ‘relaxation’ and the difficulty we have with its real meaning, the lowering of shoulders and elbows being only partway to understanding the concept. Power was important but the way you find it even more so; the power of youth will desert you in the coming of old age. . . Our task is to find it in a different way. 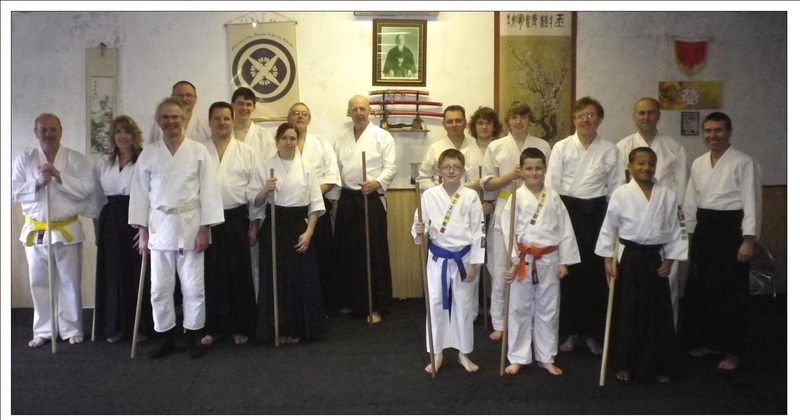 Shudokan Barnstaple students were well represented at the workshop. Chief Instructor Tenchi Ryu Aikido, and based at the Budo Centre. Brian both opened and closed the event, starting with meditation. . . which is an important part in the search for peace and which too many ignore, and closed it as one of us in the line, a line of aikidoka in harmony. Once again there was an emphasis in techniques in being centred, connected and able to be free of the attacker at will, good timing and ma ai being an important part of the whole. The peace Brian carries within himself is evident, whether some attacker will find it is another question! No matter how long we practise, we remain the student, I shall ever look upon this event with happiness and know that on this day, we were one family, a family at peace, a dream achieved. 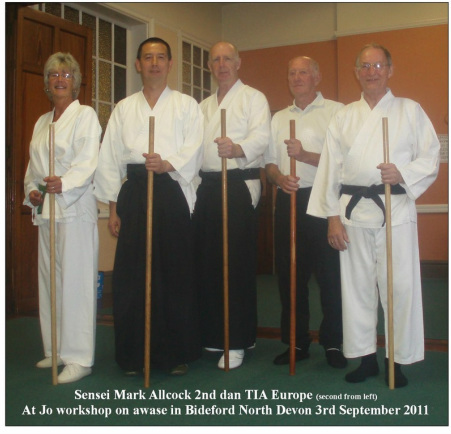 The normal Aiki Jo class in Bideford on the 18th September will reflect on our search for peace. 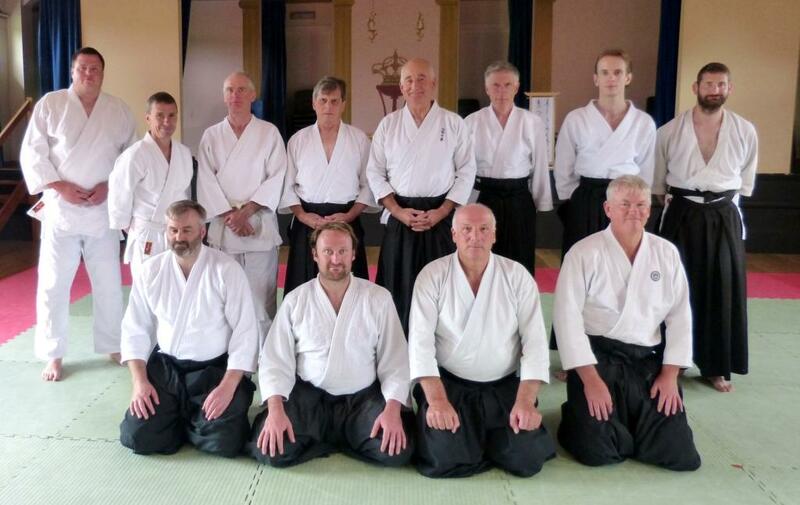 24th August 2013 Bukiwaza workshop with Sensei Paul McGlone at Wellsprings Aikido Dorset. 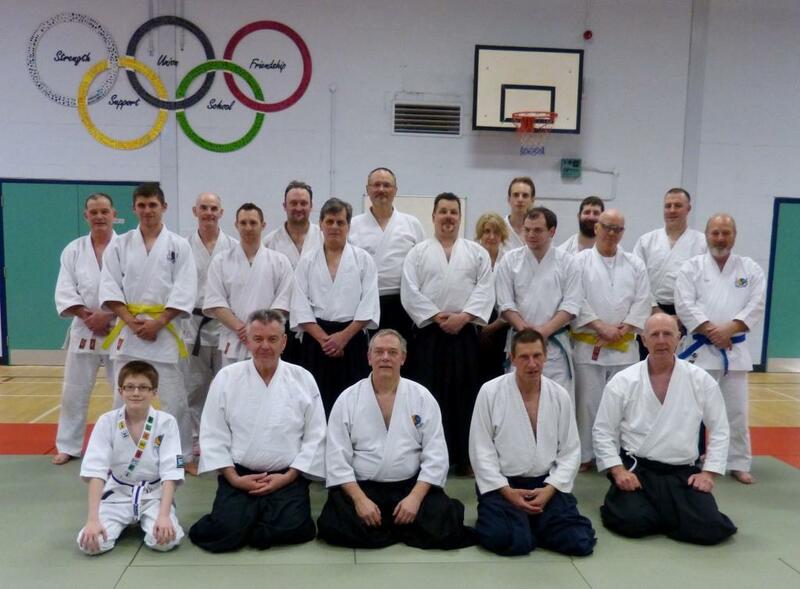 An excellent and informative session on the 31 Jo kata and its partner work. Variations were also demonstrated. It was a shame that more students weren't available to attend this most interesting of workshops on aspects of Aikido less frequently explored. 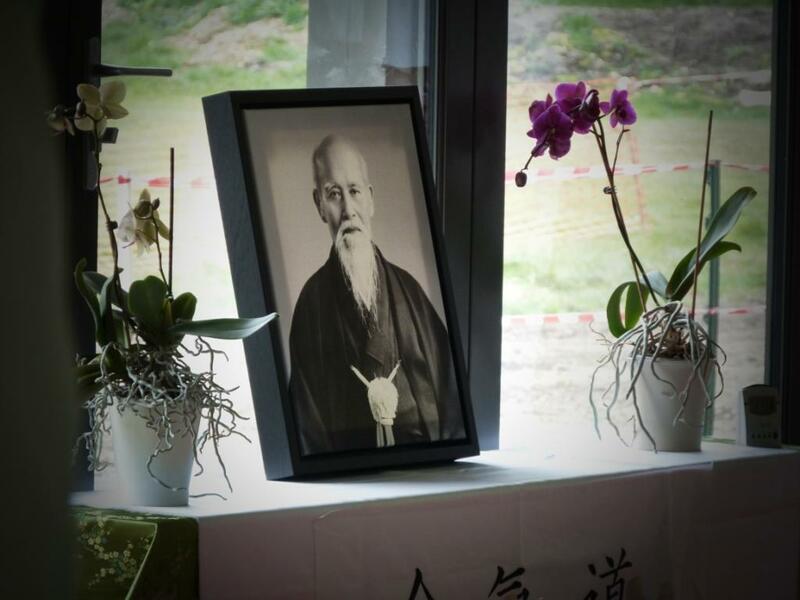 The event was in aid of charity and in the name of the peace O-Sensei sought to reconcile the world. The lesson plan on Jo Nage can be accessed by a link provided with the aiki Peace week information. Every year, hundreds of peace-oriented organisations worldwide celebrate with thousands of Peace Day Events. Churchill Close, Sturminster Marshall. Wimborne. Dorset. BH21 4BQ. Entry to our special keiko is by donation and all profits go to a charity working in our local community. Green Cottage Riding for the Disabled Association. If you are intending to come to train at our Keiko it would be helpful if you could let us know, by emailing enquiries@wellspringsoftheeast.co.uk, so that we have some idea of the numbers attending. Once again Sensei Paul excelled himself with total clarity of purpose, clear demonstrations with pertinent explanations and helpful guidance to those with questions, all answered with sound reasoning; such was the order of the day. 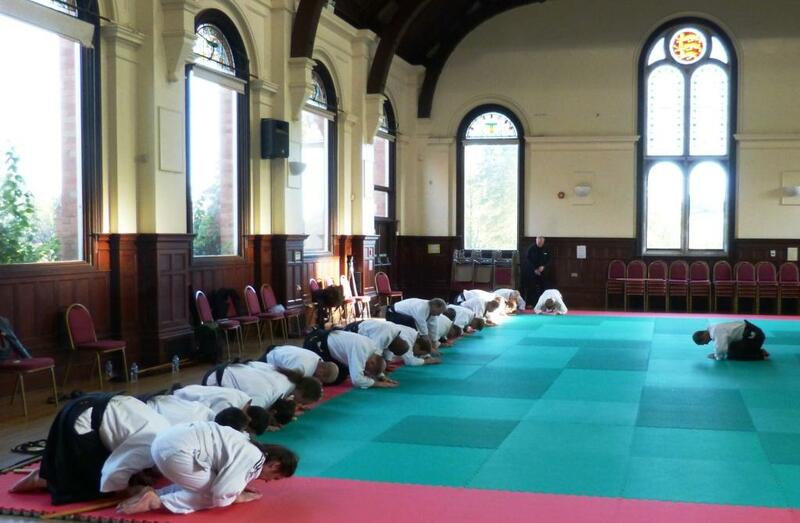 The course was well attended, with the hall giving just enough room for all to attempt the 31 kata reasonably unimpeded. Consider why you might go to such an excellent seminar with one of the most technically excellent teachers you could find. Now consider why you weren’t there. (Family needs and work excepted). Too far? Students came from Reading, Taunton, and even Hartland in Devon all up to 3 hrs driving. Too dear? Tell me what else you could get for that price that gives so much personal advancement. Too difficult? Plenty of beginners there completed their journey. Too easy? Already know that Kata? You can always learn something. . . I certainly did. . . something very useful too. Weather too warm? Too cold? Going to buy the video or better still borrow one from someone who did attend? Going to look it up on U Tube there’s loads of 31 kata on there, and so there is …. and plenty of mistakes for you to absorb from them too. No one could or should force you to a seminar but those who attended walked away happy afterwards with new skills, new knowledge, new understanding and the simple pleasure of merely knowing they were there on that day. Any interest in Aikido weapons and Sensei McGlone’s Bukiwaza workshops are the answer, brilliantly executed techniques from the brilliant art of Aikido. 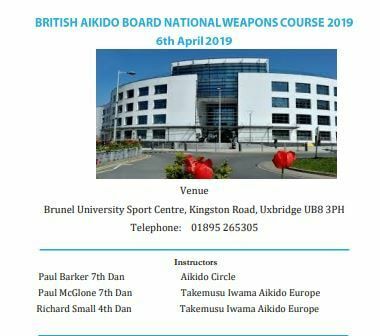 If you want to advance your knowledge of Aiki weapons you won’t find much better than these Wellsprings hosted events. A happy ending (or was it relief ?) for Friday evening Wellsprings Aikido Dorset class. The theme . . . using the hips. Yes, we all know that . . . . but how? including origins, a rarely taught pin, all attacks including tanto and tachidori. 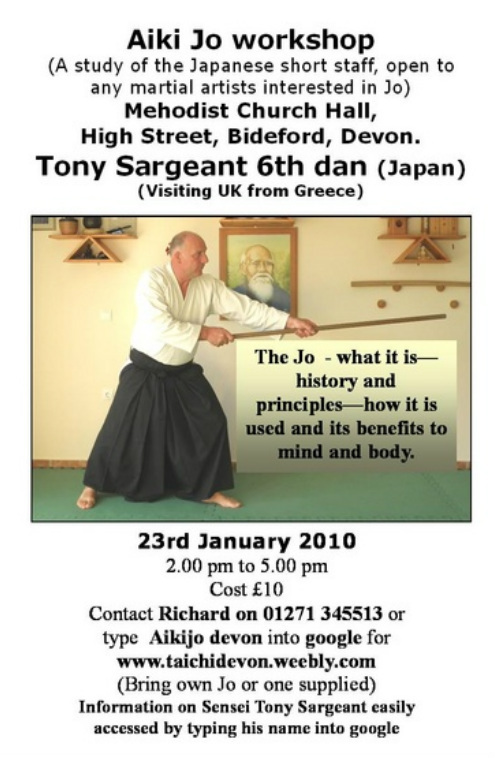 We studied in particular two principles as taught by Sensei Tony Sargeant at his workshops in 2013. Friday evening class at wellsprings Aikido 21st June 2013. . .
A Kotegaeshi workshop, a relaxed class in which students sought their own discoveries. We looked at a powerful, if not frightening, Aiki Jutsu version of kote gaeshi and its kinder Aikido offspring. We explored open hand and closed fist attacks and attempted ways of dealing with either and we experimented with a rare pin, (which I’ve not seen for many, many, years now) where the uke stays on their back. The pin is only effective if the correct pressure is applied that arches the uke’s back thus preventing rolling out of the pin. It wasn’t easy and we could all see some dangers in it, but none the less we all explored the idea. 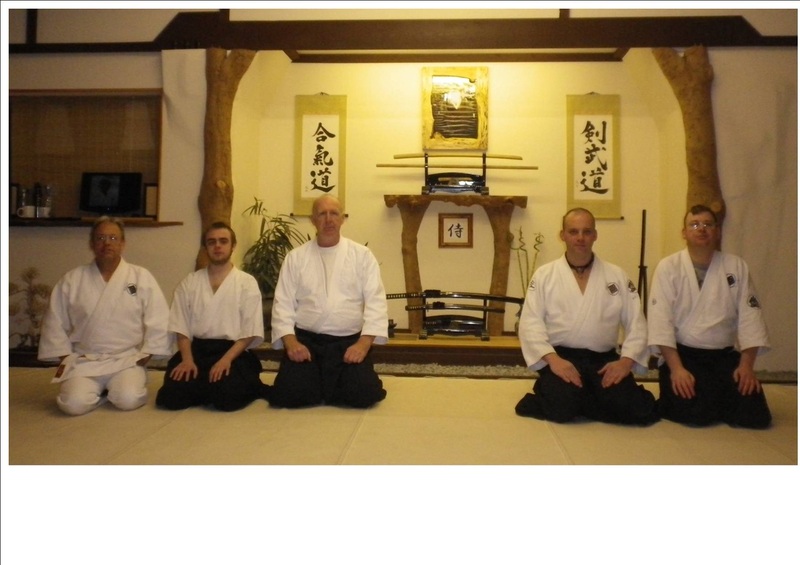 We then kept to the principles that have been highlighted by Sensei Tony Sargeant at his recent seminars in 2013. We looked in detail about the principles of wrist turn, the grip thereon and the angle required for control, all as seen on seminars earlier this year. We covered most attacks and also changed partners frequently in order to find the common ground each time, also as Sensei Tony encouraged especially at the Reading Club’s seminar. Ushiro ryoto dori . . the need for relaxation and body movement. Shomenuchi, yokumenuchi, Tsuki, tanto dori and tachi dori. 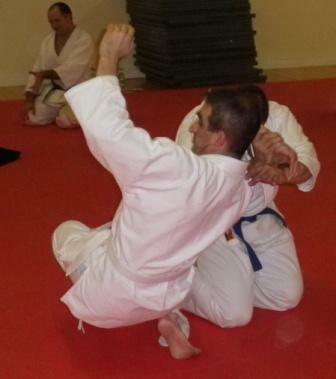 . . the invitation to uke’s attack and the required moving off line along with the correct balance taking, positioning and control to effect a kotegaeshi throw or immobilisation that does not give uke any other options but to comply. It was a busy class and there was much more still to look at when we ran out of time. . . Mark’s students did extremely well considering some of the material we studied was new and the short time for each attack. If they only took away the single principle that is kote gaeshi itself then they will have something that should work for them in the future. . . any future. Jo nage and Jo dori were practiced. A very mixed class but all going in the same direction. . . happy. Sensei War Lewis (right front) of Shinsei dojo hosting an aiki ken workshop. It was a great day which began with some archery practice before moving into the splendid dojo for our weapons practice. We studied the first kumitachi with several variations that included tachidori. 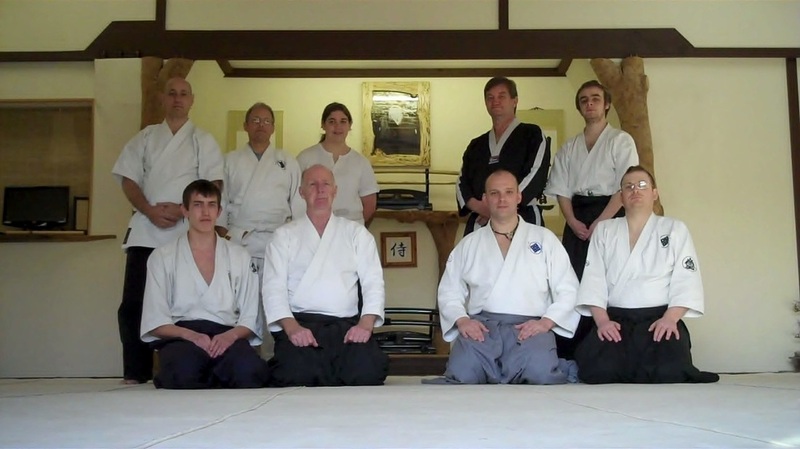 Cambridge Aikido Club hosts Sensei Tony Sargeant 24th Feb 2013 One day workshop mainly looking at principles and how we often ignore them in our practice. At last Sensei Tony Sargeant is putting pen to paper and is in the process of writing a book. 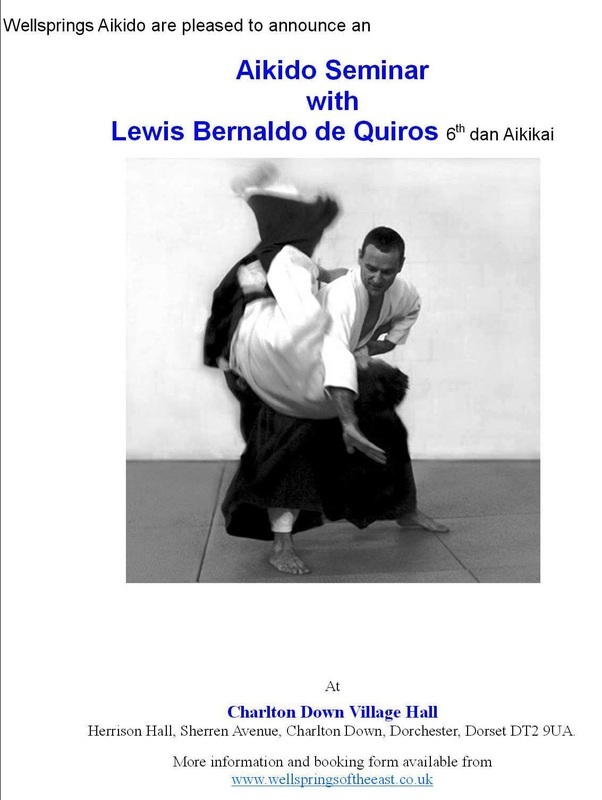 I am sure that it will be a fascinating journey into discovering more of the man himself but also what he can offer us all in terms of some deeply thought out views on improving our own Aikido. I look forward to seing the completed works. 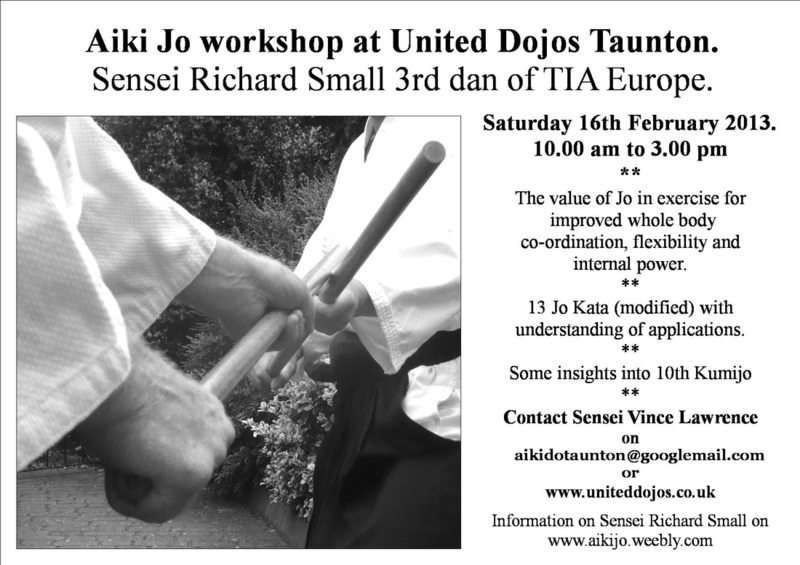 United Dojos of Taunton Jo workshop. The photo will speak for itself. A great day. Sensei Pete Reynolds . . . inline with O'Sensei. . . in more ways than one. 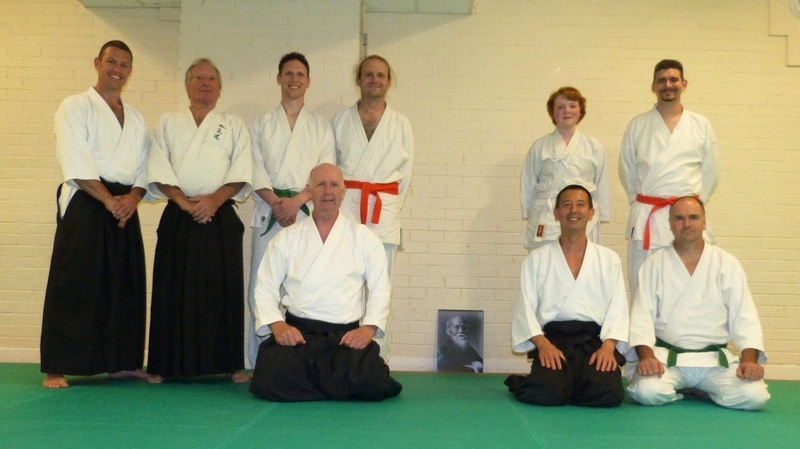 Report on Sensei Pete Reynold’s class 30th November 2012 at Wellsprings Aikido club. A cold and dark November night and a 240 mile round trip just for an hour and half aikido class. Mark Allcock, founder and resident Sensei at Wellprings Aikid had invited 4th dan Pete Reynolds to teach. I knew the journey would be worth it, and was not dissappointed. As they say, “don’t be afraid of going slowly, only of standing still”. We started with a group photo, just in case we forgot at the end. Sensei Pete Reynolds of TIA Europe is a confident yet humble man and an easy going yet competent teacher; in fact his relaxed manner is a bonus to his teaching. More than this, Sensei Reynolds has, through his own long and sometimes arduous journey, developed some amazing insights and skills. We began with, “the most important practice you will ever do”, tae no henko, and were immediately treated to some useful advice that changed our strugglings into comfortable success. The principles were everything, positioning, posture, attitude and blending. Remember always that ‘seeing is not seeing’, sometimes you need the teacher there to tell you what you should see and not what you think you can see; the words alone are valueless without the dynamic guidance of a knowing teacher. . . one who has gone before. With such skills it would be easy to impress and leave students struggling and envious but Sensei Reynolds was there to share his enligtenments with all who wished to know; he was most generous in sharing his knowledge and skills with all of us. Next exercise/technique was morote dori kokyuho – and even more principle based enlightenment. Why do we make things difficult for ourselves when there is a better way? One of the points made by Sensei Reynolds was, “uke has plenty of power of his own. . . why should you give him any of yours. . . do not add anything to the struggle’. After plenty of opportunity to practice we moved on to Shiho nage, standing and suwariwaza. Same old technique practiced for years but now including our new principles. . . what a difference, the struggle was removed, we ceased to become the attacker instead of defender. As we ran out of time, Sensei Reynolds gifted to us, in my eyes anyway, a great secret, (they are always elusive secrets until you know the answer !) ; how to make a powerful yet effortless intervention to the yokumen attack that takes both mind and body of the strongest of opponents. Sensei Reynolds was not yet finished, in timeless tradition we practiced kokyu dosa. Demonstrating a flowing , natural and flowing movement of free will he then assisted students in finding the same. . . well, sort of similar anyway. Sensei Pete Reynolds of New Forest Aikido, a skilled but humble man and if you have any interest in Aikido one worth seeking out. 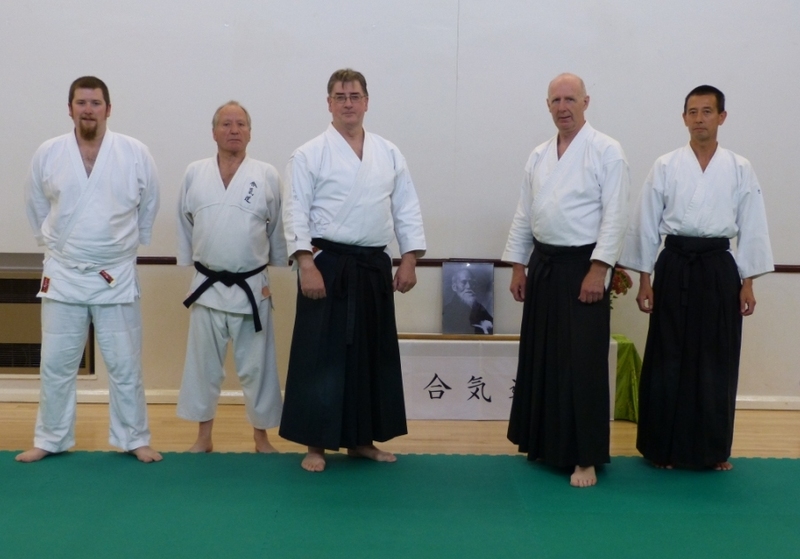 This last Thursday I had occasion to visit the Hartland Aikido Club run by 2nd Dan Huw Collingbourne at Bucks Cross in Devon. Visiting other clubs and styles is an excellent way of putting your own beliefs into perpective. An open mind is essential ... like parachutes only useful when open ! Execises simple to the beginner in the visited Dojo become a struggle for the visitor as they try and fit their body to new mechanics. Just as well that the observant teacher slows things down and explains in detail. There were some interesting Ki exercises at the beginning of the class and my studies in Tai Chi meant I could draw parallels with the internal side of the art. It's a good idea to step out of your comfort zone . . . or you may never find the answers to questions . . . some of which you may not have asked yet !! A most enjoyable evening with some real learning to take away. 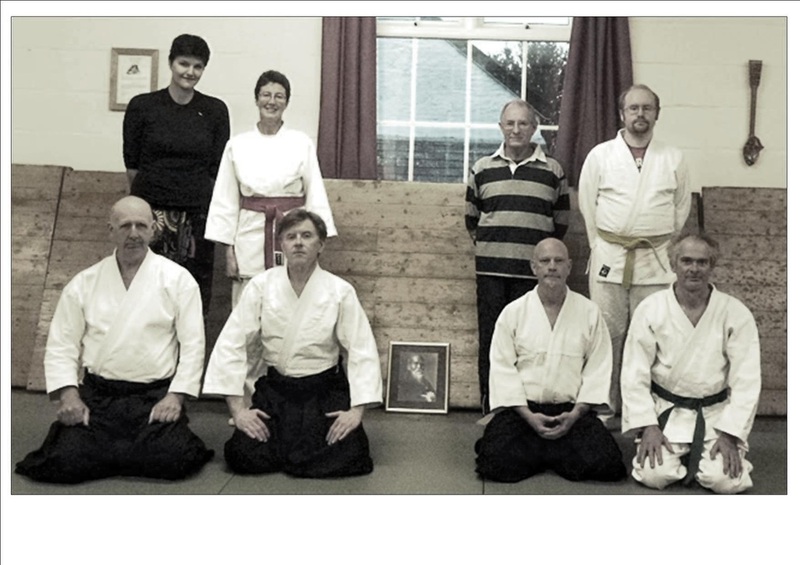 A way of peace class at Phoenix Martial Arts in Corfe Mullen Dorset. Sensei Mark Allcock 2nd dan TIA Europe of Wellsprings Aikido (Dorset). both within ourselves and our surroundings. On 15th September 2012 from 10.00 to 11.30 am. We looked at the need for opposites for mere existence in this universe and how we can harmonise these opposites so that there is little or no conflict. We looked at being centred and calm and how this improves our chances of effortless power and of peace. We found peace by non conflict. . . which is not the same as giving in, retreating or losing. We looked at the enemies within which need dealing with first. 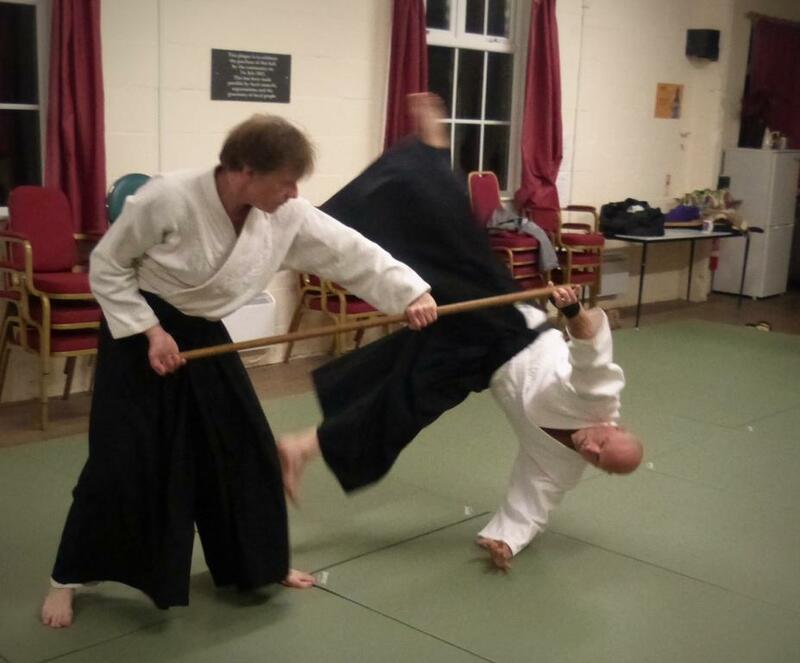 . . and some other stuff which included an advanced tachi dori utilising what we had learned in exercises and also a different way of achieving Kokyu dosa successfully. Thanks to Anne and Mark we enjoyed a delightful garden party at their house in the afternoon. All just wonderful and peaceful. for Sensei Mark Allcock 2nd dan. Subject. Some requirements from the grading syllabus on Jo and Ken. Emphasis on maintaining aiki principles throughout. The lesson plan changed on the night and our practice of exercises and techniques was carried out using the characteristics of the tai chi symbol behind the group. That is, no beginning, no end, no straight lines, no gaps and nothing broken and that the opposites did not conflict but boundaryless they existed in harmony. Spirals, circles, good posture, good energy and good psychology. . . all used to advantage. Subject mainly 31 Jo Kata and partner practice, some variations to Kata and also to the partner moves. We managed over half way with the partner practice looking at some finer points on internal power then finished off the last hour's training with a variety of Tachi Dori. A most enjoyable day ... and the Sun shone too. 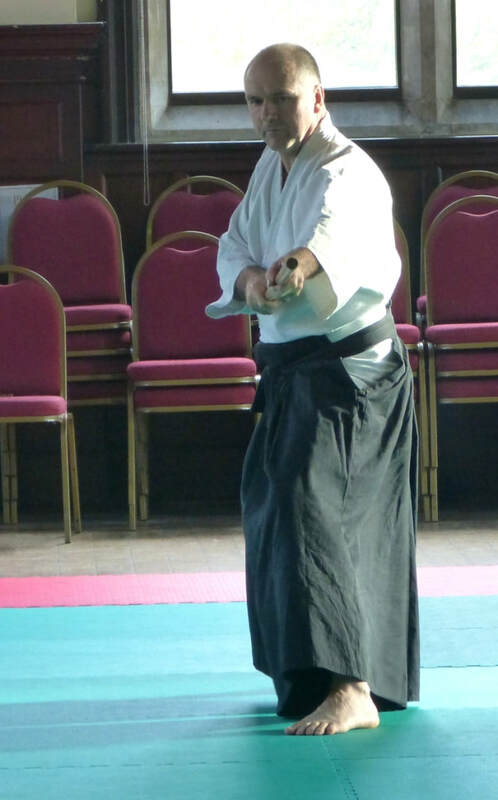 Subject was how we can use the hips in Aikido weapons and what is possibly meant by the term hips, in conjunction with a short piece of Jo kata and then that piece of Kata as a partner practice. ... to include the mutual importance of being uke or nage. Plus study of one particular Jo nage move that accentuates the use of hips, in fact we looked at its close similarity to one version of koshi nage .... hips and extension the ki to success in aikido ! . We had a quick look at one of the 'secrets' of Tachidori and also how weapons practice applies to taijutsu. Photo shows some of the students that attended, and they did so very well with such an advanced understanding. It is all very simple. . . just never very easy ! Applied principles are close to all you need ! A most enjoyable and relaxed atmosphere workshop where we tried to thoughtfully study principles and consider their value and what they might mean to us as individuals, to both our bodies and minds. It was such a pleasure to meet up with and explore the path with good students from other towns and associations. . . to my mind , true Aiki. Dermot Hogan " " " "
with students, Paul Stacey, Wayne Burlow, Steve Wroe, Jago Young. 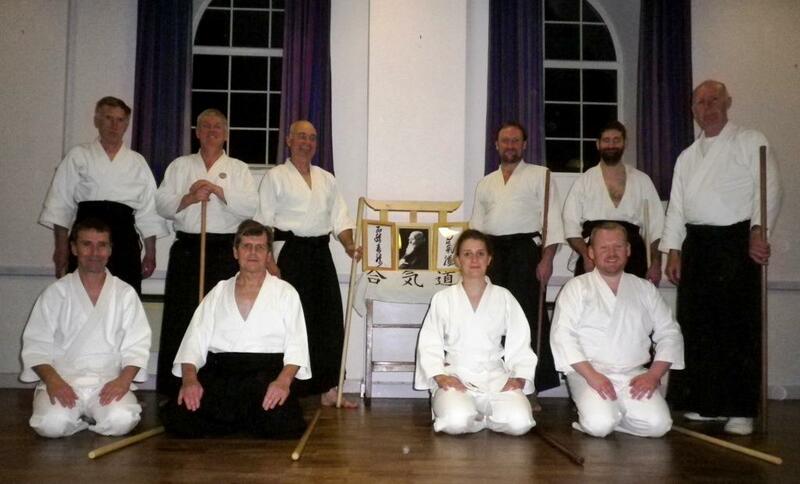 Will Watts 1st Dan of Shudokan Barnstaple. What a really great group of people, lots of good energy, some serious study but some happy smiles too. How wonderful for people to come together in the spirit of Aiki. (Thanks to Gill and Roy who kindly made the tea and put the biscuits out ... and Wendy for the rapidly eaten cake with strawberries on). 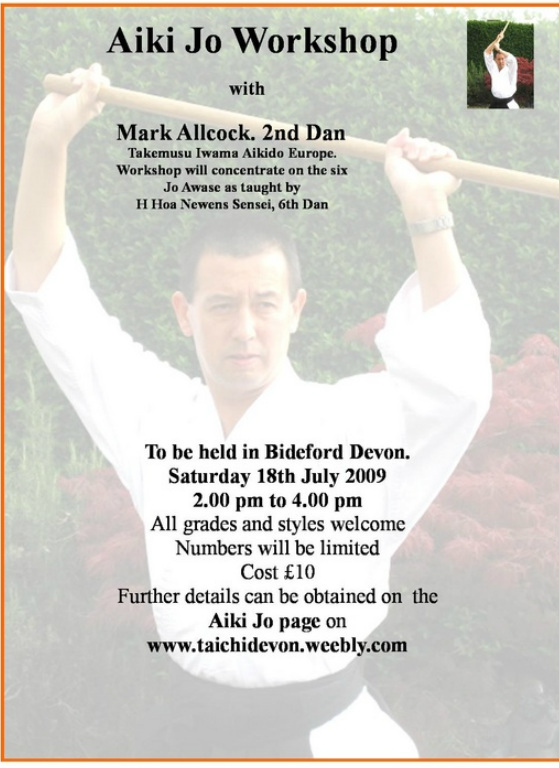 21st July 2012 Aiki Weapons Workshop, Bideford. A group for the Sun to shine on. Happy days. Sensei Seggei Stoliarov with Jo demonstrates ken tai Jo with Mark Allcock. 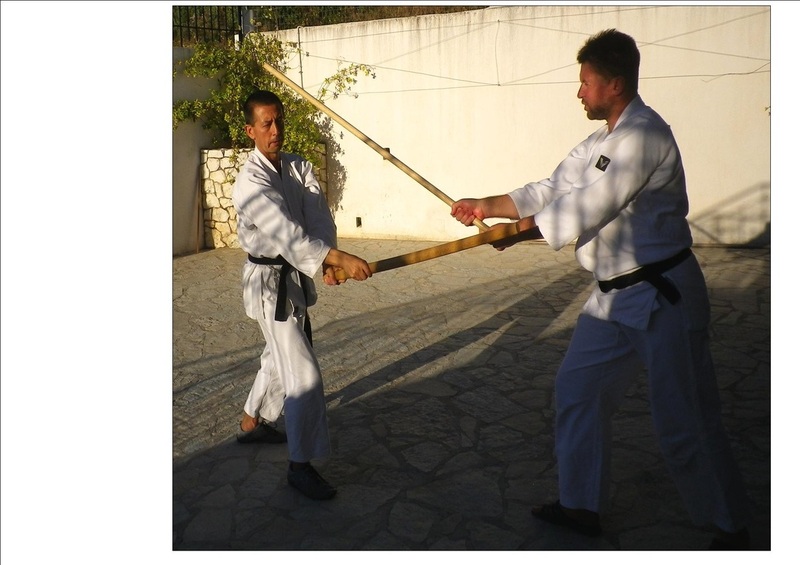 The study of Aiki Weapons exposed us to some innovative ideas on new and old themes alike. It can take many years to understand what should perhaps have always been understood from the beginning. . . once we think we know, we stop looking !! Leave your comfort zone to find out. Sunday 6th May 2012 14.00 t0 18.00 hours. 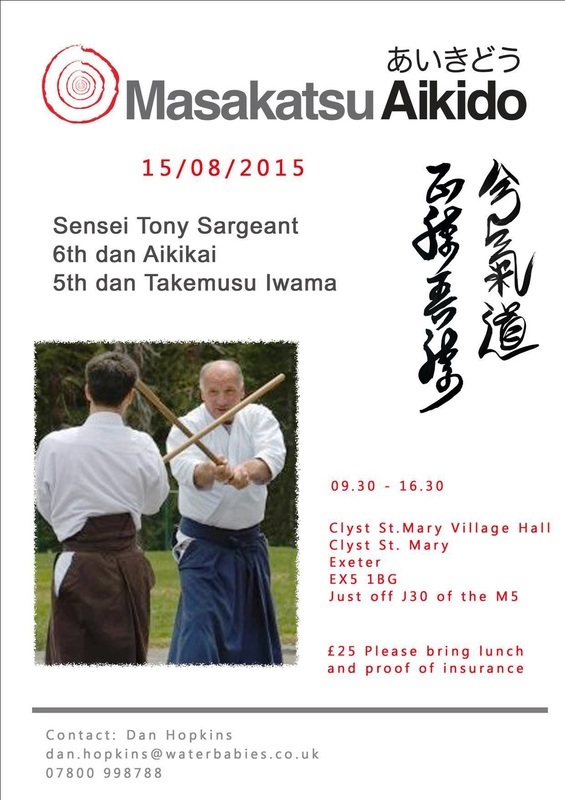 on the Somerset / Dorset border contact Sensei Lewis if interested in attending his seminar. We looked at some interesting internal power exercises, explored some ideas on the use of mind and practiced the 31 kata with a view to understanding how and importantly why a move was made. A celebration to honour O'Sensei and all the teachers that have gone before us. 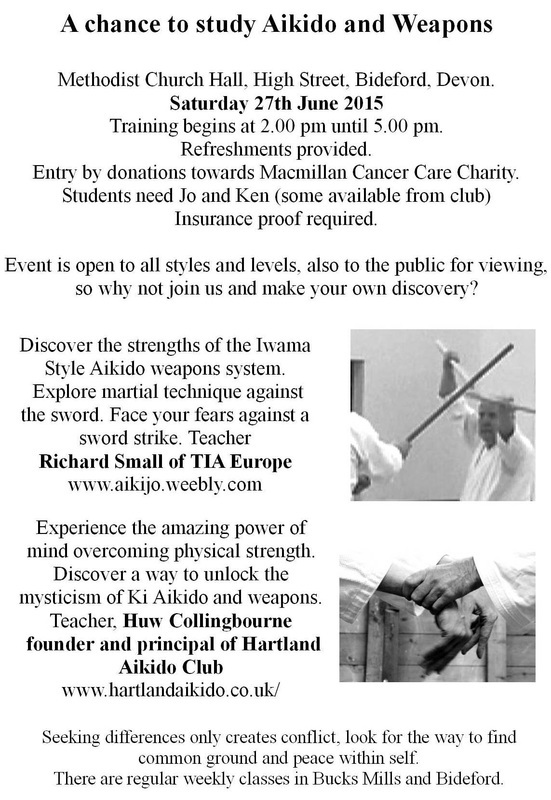 Dorset teacher Andy Channer inherited the club from his late teacher Sensei Tim Buswell and then hosted this event to raise money to buy some mats. Thanks to the generosity of the undermentioned teachers Andy made an undisclosed sum of more than enough to buy mats. Sensei Paul McGlone 6th Dan, Sensei Chris Bartley 5th Dan, Sensei Pete Reynolds 4th Dan and Sensei John Garmston 4th dan gave freely of their time and skills and generously taught Aikido sessions and the seminar opened with a brilliant Kung Fu demonstration by Shaolin Monk, Shifu Shi Yan Ming. Lots of principles taught and lots of beneficial corrections handed down. An excellent day to be with some old friends that still walk the path. 1400 to 1800 hours on Sunday 25th March 2012. We studied the 31 Kata and the partner practice as well as looking at some principles and exercises that can develop them. Some awase (blending) exercises too to enhance Jo partner work. We looked at some principles of posture and energy and tried to put them into a practice of the 13 kata. A version of the 13 slightly altered from the traditional for a given purpose. We looked at why particular moves were made and how and why the kata alters once it becomes partner work. It was a pleasure to train with such enthusiastic and genuine students of the way. I tried to find a photo with me smiling .... but at least they all are !! A most enjoyable day, thank you. Richard. 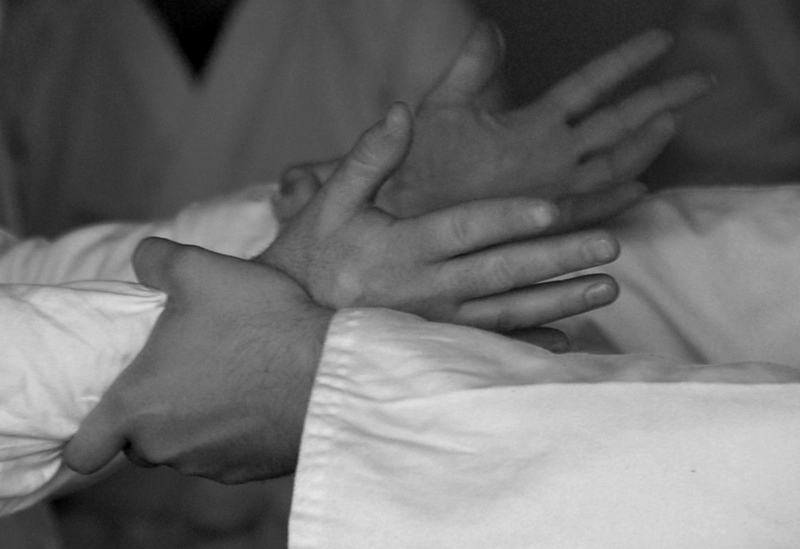 Wellsprings Aikido meet at Phoenix Martial Arts in Corfe Mullen, Dorset BH21 3LE. Time is 09.30 to 11.00 am. Subject; Aiki Jo and how it helps us study and change the body. We looked at how to hide power by using body not arms and how to feel it in self and others. 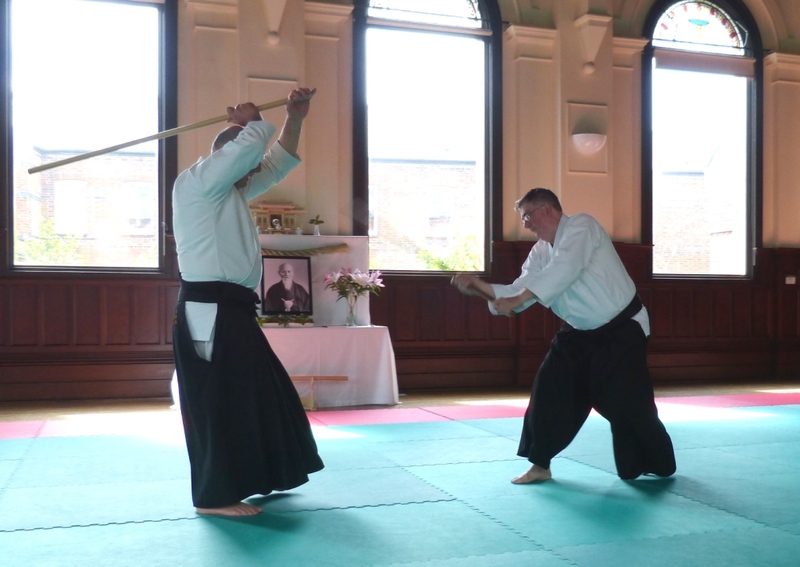 We briefly explored exercises borrowed from the late Sensei Koichi Tohei and from Sensei Paul McGlone. We considered the principles of posture and movement and then applied them to a short Kumijo that was formed by Sensei Tony Sargeant (involving tsuki to low middle and high, the value of the kumijo was evident in the students being able to perform effective defences that moved their partner off line while still maintaining their own. We had a quick look at hachi noji gaeshi suburi too .... which meant that we forgot to take a photo. So as not to dissapoint, here's one of Sensei Mark. Richard. Sensei Mark Allcock in Kumijo practice. The proposed programme is intended to cover aspects of the Kumijo and Kumitachi. It would be easier to say what we didn't do than what we did. An absolutely excellent course that covered so much, enlightened us and challenged our current understandings. A most enjoyable and worthwhile day. Just a glimpse of what we looked at in outline only; essential principles for both body and mind if we are to advance in our understandings and experience in Aikido (aiki weapons), 31 Jo kata, postures and reasons , extracts of the 31 Jo Kata partner practice, exercises in Jo partner work, extracts from kumijo ..... all calculated to enhance the students learning .... 6th and 7th ken suburi , 5th kumitachi ... with lots of interesting detail that you might never have considered, a whole range of henkas (variations) from selected kumitachi, some empty hand partner work against the ken using ki musubi no tachi and a look at some kentaijo (staff and sword work) ...... but so much more in terms of personal guidance by the teacher Sensei Paul McGlone 6th Dan of TIA Europe and Poole Aikido. 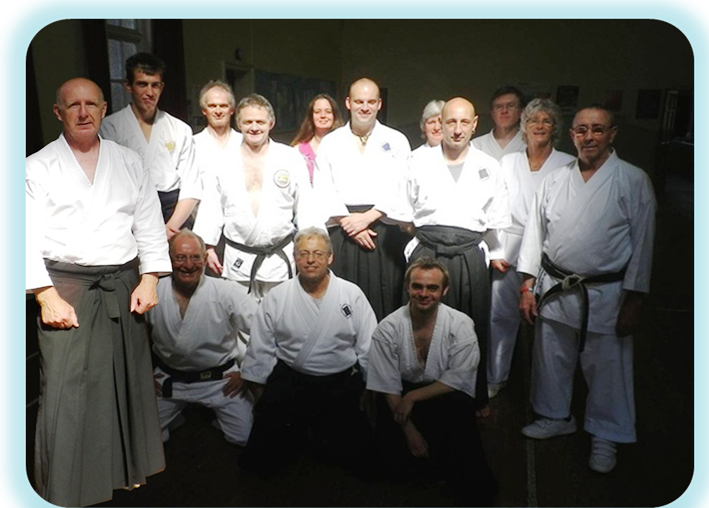 I had the pleasure of teaching Aiki Jo to the students of Sensei War Tenshi Lewis at his Shinsei Dojo on the Somerset / Dorset border on Sunday 12th February 2012. We examined postures, angles and use of internal power through Jo exercise and the 6 kata, we looked also at reasons why an action might take place. Below; photo taken after training at the Shinsei Dojo, a beautiful dojo and an excellent quiet place for training workshops and one day courses. 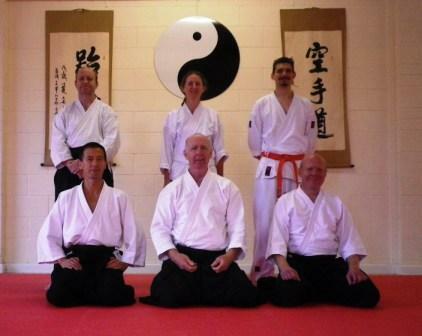 Above photo; weekend seminar organised by Poole Aikido Club, 5th and 6th November 2011. Photo shows myself left training with Sensei Terry Young. Teaching was the usual barrier breaking excellence from Sensei Tony Sargeant and Sensei Paul McGlone. See also Gallery Photos and Item on Contributors page. 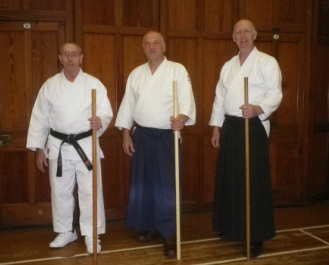 Above Left :- Sensei Bill Hollister Karate 6th Dan joined us to find out about the use of Jo in terms of the art of aikido .. (on the links page look for Tamar Tai Chi to see that bill now teaches Chi Kung and Tai Chi). Our teacher and guide for the workshop, Sensei Tony Sargeant 6th Dan Aikiki and renowned Bukiwaza exponent (centre) on the links page TIA Europe will tell you more), and hosting the event Sensei Richard Small 3rd Dan TIA Europe Group photo on right includes students from as far away as London and Swadlincote in the midlands. Local teachers from the Braunton club Senseis Jenny and Morgan were the only local representatives of the North Devon aikido dojos.Three of the Bideford students were joined by one other who had turned up on the day to give it a try ... and did very well too. A brilliantly taught treatise on the use of the Jo. Using partner practice in the 13 Kata we examined the purpose and meaning behind the choreography, the importance of precise posture, the attitude to and importance of spirit and martial awareness. Everyone had personal attention and advice on corrections to improve their aiki journey. I have seen many teachers and for ability to show what should be done and to show why it should be done as well as how, you'll have to spend more years than I too find one better than Sensei Sargeant. 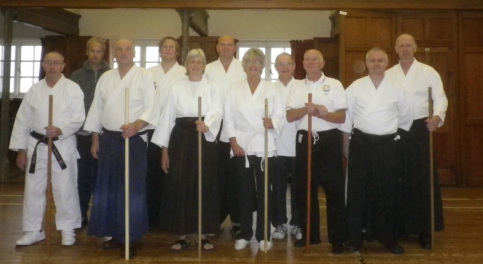 I was honoured to have the opportunity to teach a short session on Jo for Sensei Vince Lawrence (front centre) in West Buckland on the 1st October 2011 as part of a one day event with other teachers. Even the children's class joined in with the Jo session ... with shorter Jo of course ! It was a most enjoyable and pleasant 'family' day of training and we were well catered for with food and drinks by the organisers and friends. We enjoyed one of the warmest Somerset October days on record as a bonus. Good Karma perhaps found its way home. 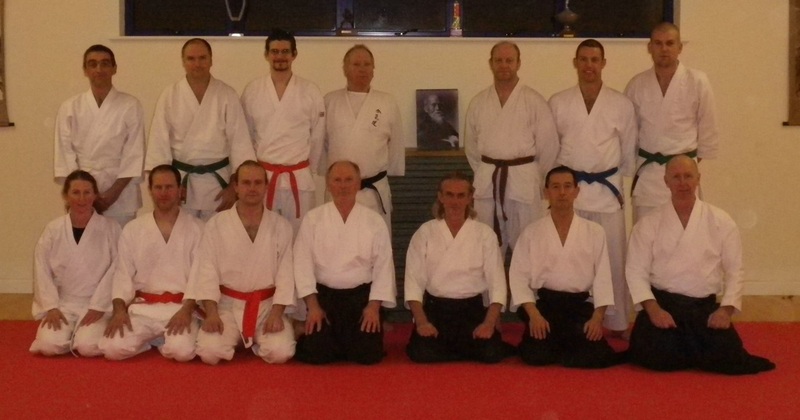 Sensei warwick of shinsei-dojo.co.uk (front right) also taught along with all the front row teachers. 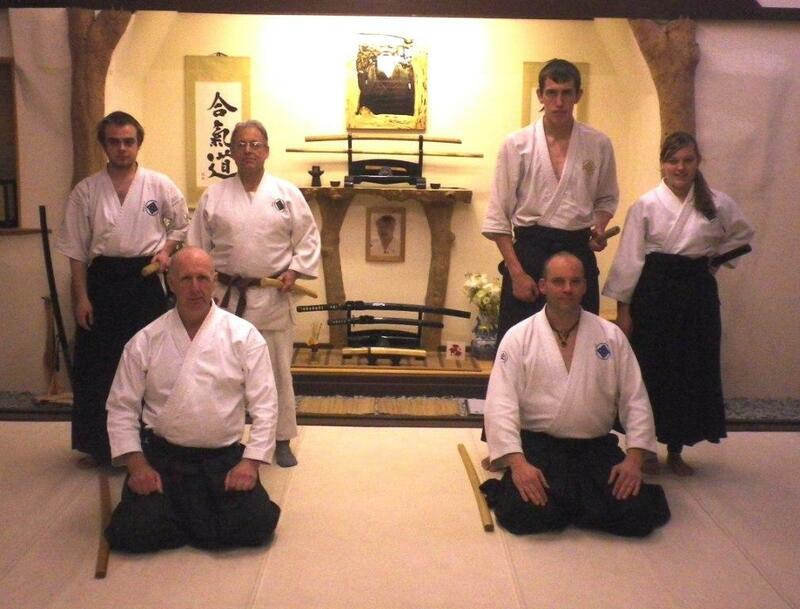 He has set up a beautiful Dojo and the web site is worth a look. On the day we looked at some body principles using Jo, the 6 kata, some of the common errors in performance ... and the way to correct them. ...... we always run out of time ! Don't take my word for it, come and see for yourself. Excellent teaching by Mark on Awase. Sensei Mark Allcock taught a one and a half hour workshop on the 7 Jo Awase that featured in the Shodan test in the Iwama Dojo according to the writings of Sensei Daniel Toutain. 4 blending moves from a thrust to the chest and 3 to the knee. The lesson culminated in a look at the first kumijo and its relationship with the blending moves that the students had just studied. We hope that Sensei Mark will share his skills with us at another workshop in the future. We must challenge ourselves to leave our comfort zone and explore. 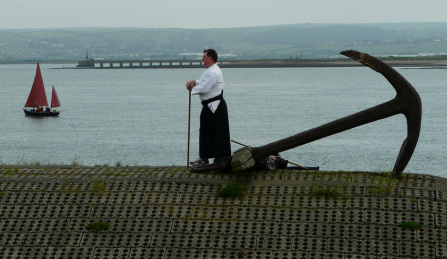 "The purpose of today's learning is to change yesterday's understanding"
Sensei Paul McGlone at Appledore, North Devon. 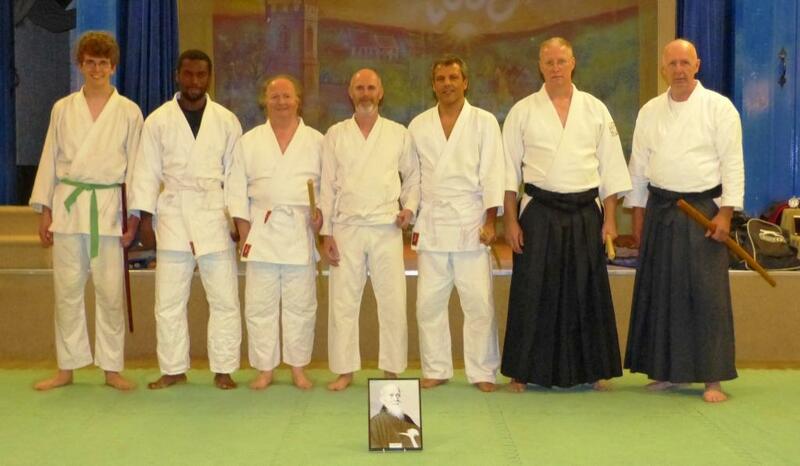 Aikido course held at Reading. April 2009 Weapons day.